Wienerschnitzel is such a funny name, although the direct German translation is somewhat mundane. 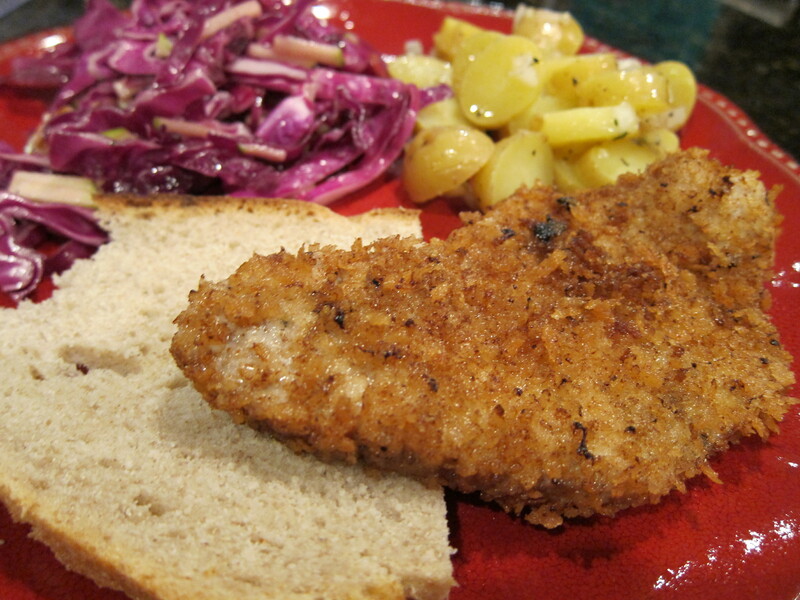 A Schnitzel is a boneless slice of meat that is pounded thin, breaded and fried, Wiener just means “Viennese”. Wienerschnitzel is traditionally made out of veal, but recently pork has been a popular, and cheaper, protein of choice. You can also substitute chicken or turkey, but veal is the best. You can pound your veal slices yourself, or, if you live around a Central Market or Whole Foods, the butchers there will slice it thin for you. I found a Wolfgang Puck recipe that came with a potato salad recipe, so I decided to try that. The preparation is extremely simple and fast. 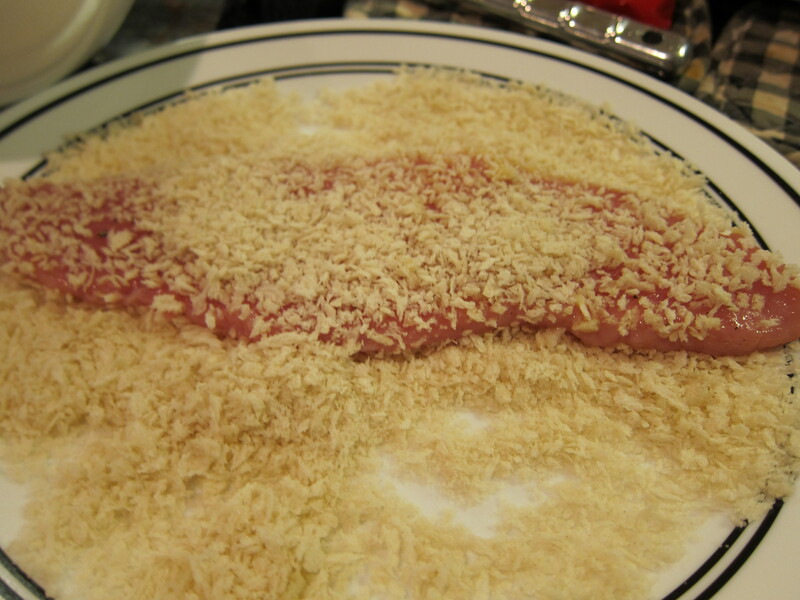 First you season the veal with salt and pepper on both sides, then the veal slices are dipped in some beaten eggs, then dipped in some crushed Panko crumbs. 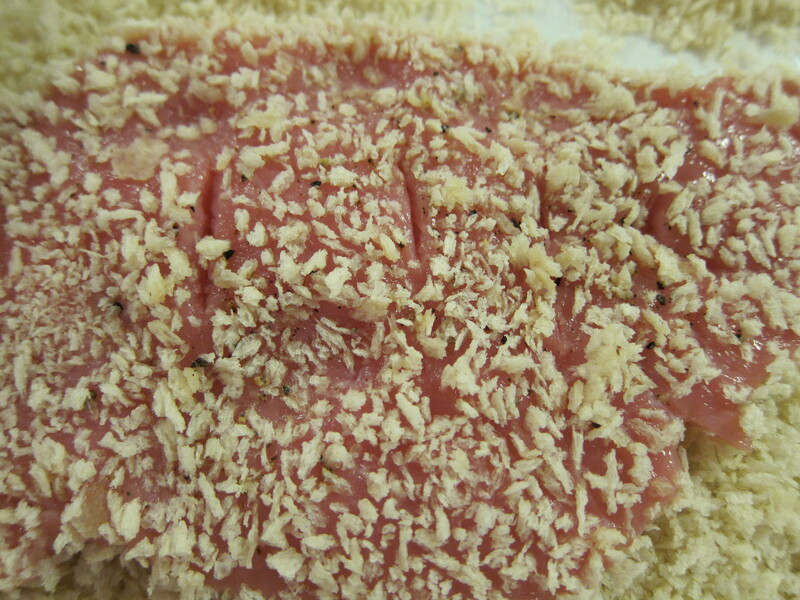 At this point, the recipe recommends that you make shallow cuts on the veal, after breading, so that when it cooks in the oil, it will not curl over. I tried it both ways, and my meat didn’t curl either way, but it’s always an option if you find it to be a problem. 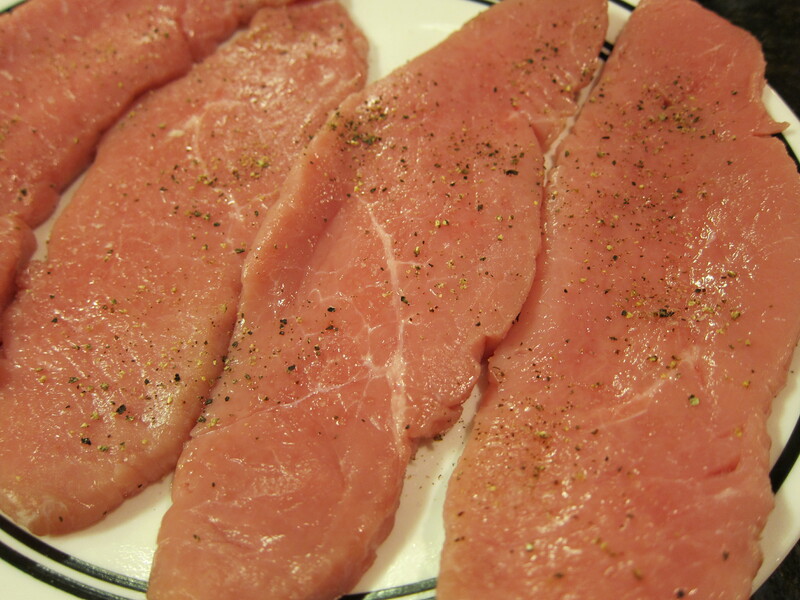 The veal pieces are dropped in a deep fryer or a pan with 375 degree oil, and cooked for 3 minutes. My pot was big enough to cook two slices at a time, but you don’t want to crowd the pan to make sure that your cooking oil stays at a reasonable temperature. The Wienerschnitzel can be drained and kept in a warm oven until you are ready to serve. I actually made my Wienerschnitzel last since the other recipes can be prepared ahead of time. The potato salad that came with the Wienerschnitzel recipe was also very very good, and simple. 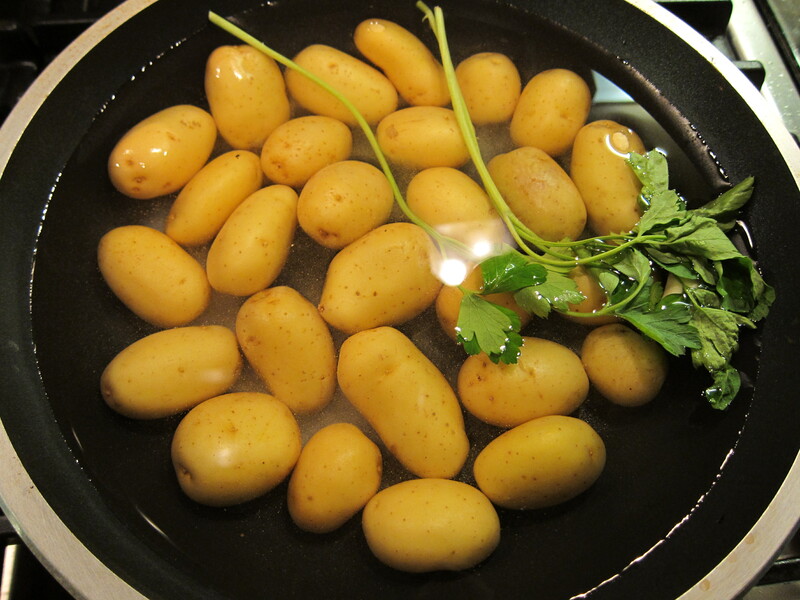 You basically boil up some fingerling potatoes in a pot with some parsley and garlic until tender, drain, and let cool. 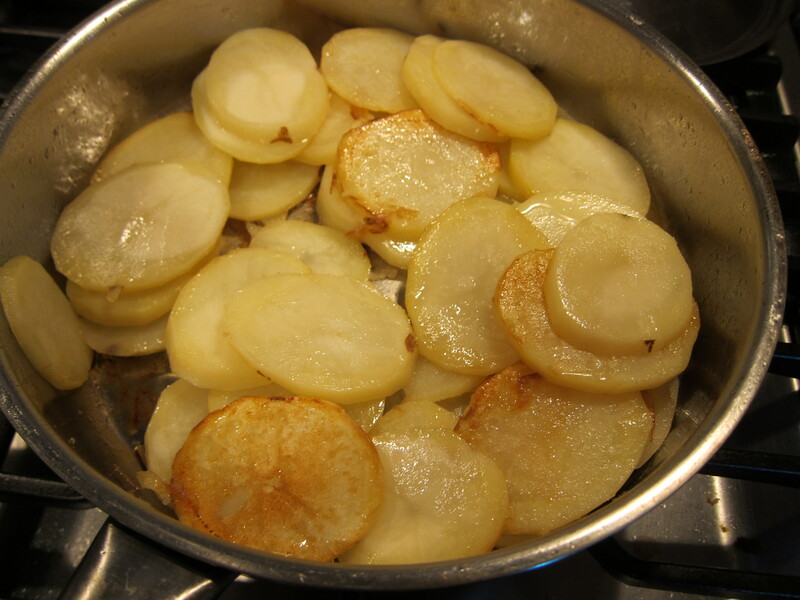 Then you slice the potatoes and toss them in a dressing made out of vinegar, oil, onions, and spices. 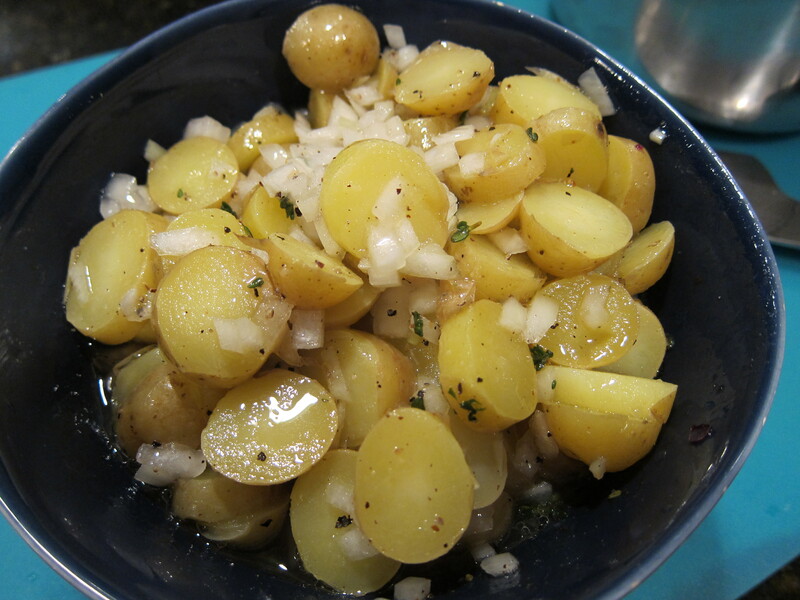 You should let the potatoes marinate in the dressing for at least 20 minutes before serving. 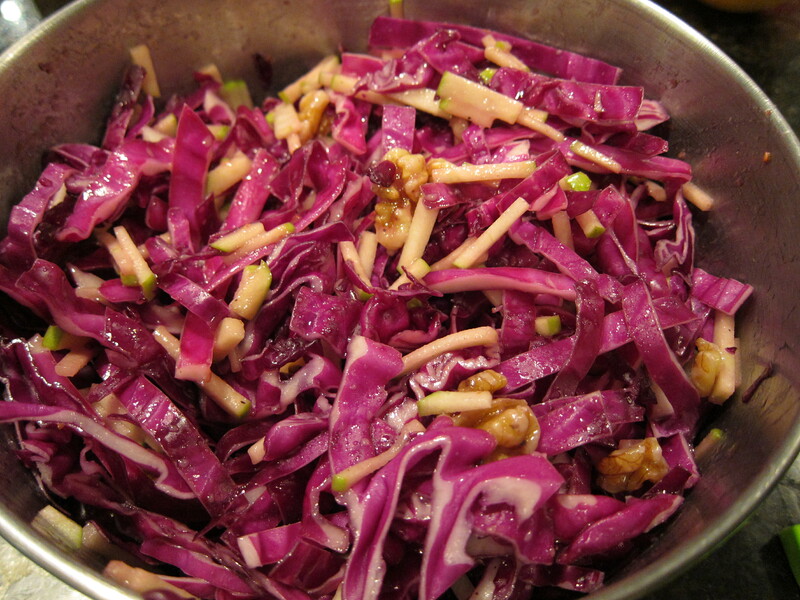 Another famous Austrian dish is boiled red cabbage, since I didn’t want to do something too traditional, I found this really great recipe for red cabbage salad with green apples from Epicurious that really worked well with the meal. 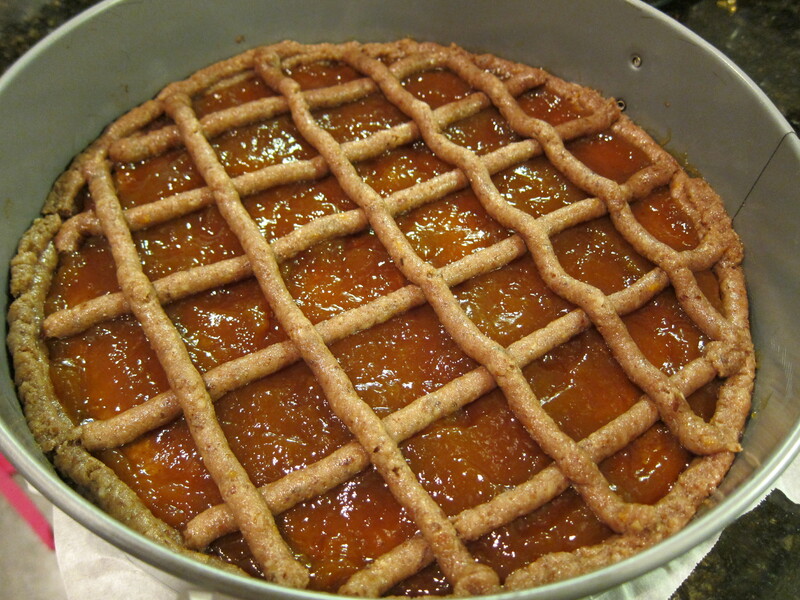 To finish up the meal, I made an Apricot Linzertorte. It’s basically a chewy, cookie-like dessert made with fruit preserves. 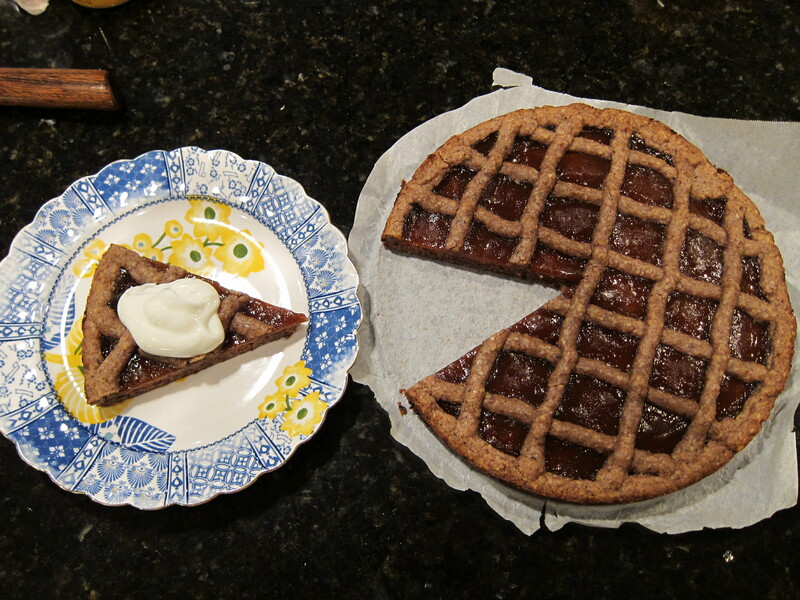 This torte also did not take long to make, however, there are a few steps that you need special equipment for. Please also note that the recipe has an error in it and the torte will take 20 minutes for the crust and 20 minutes for the topping. 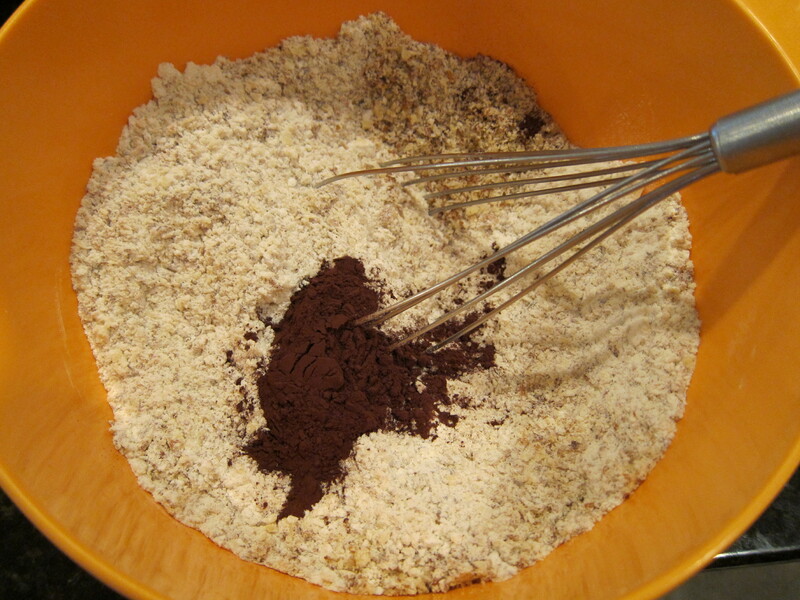 First the dry ingredients: hazelnut meal, flour, unsweetened cocoa powder, cloves and cinnamon, are mixed together. 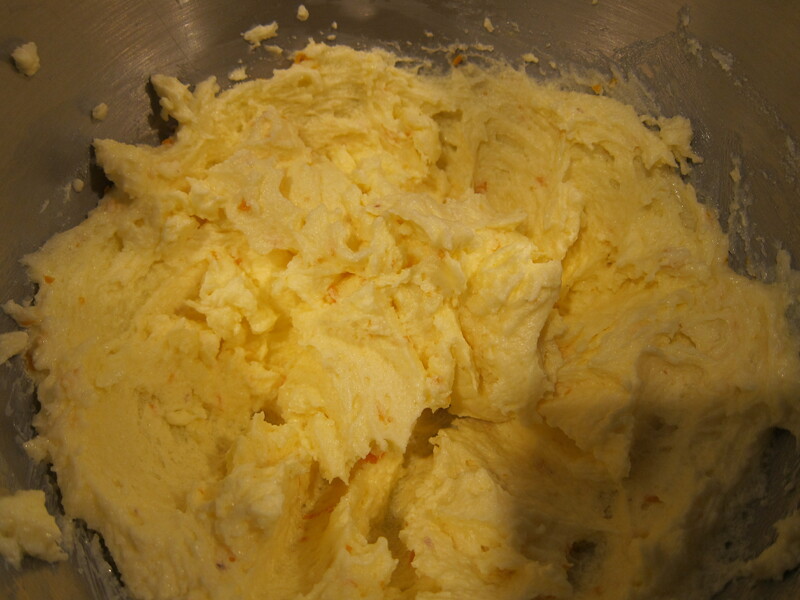 Then butter, sugar, orange zest, and eggs are blended together until well mixed and fluffy. The dry ingredients is stirred gradually into the wet ingredients, and 1 and 1/2 cups of the batter is placed into a pastry bag. You can use a large plastic ziplock bag if you don’t have a pastry bag, simply cut a corner off the ziplock and you will have a ghetto pasty bag. The rest of the batter is spread on the bottom of a springform baking pan, and baked in the oven for 20 minutes. 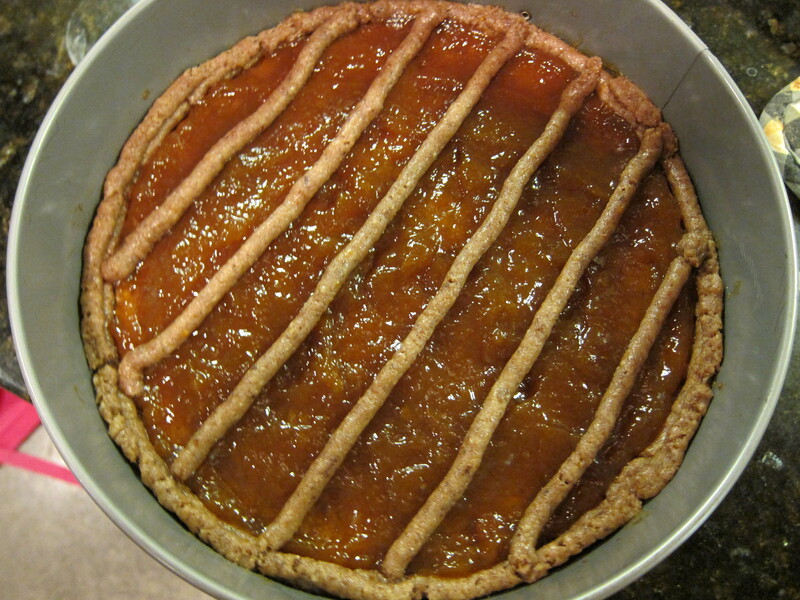 After the crust has rested for 10 minutes or so and cool down some, Apricot preserve is spread on the bottom. I suppose you can use any preserve you like, and for the 10 inch torte, I was able to use the whole 11oz jar of preserves. 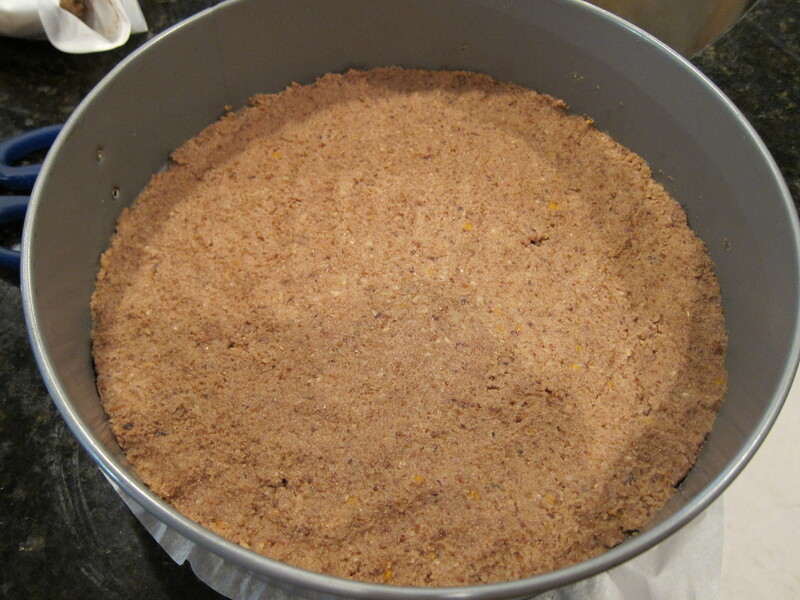 Then the batter in the pastry bag is pipped on the torte. You want to do 5 or 6 lines of batter for each lattice direction. The batter will expand during baking process. 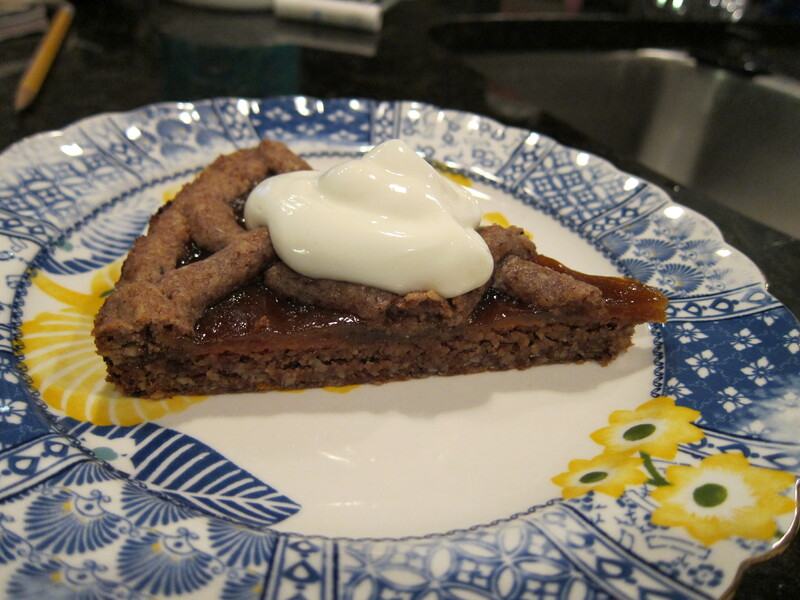 The recipe calls for a mixture of heavy whipping cream and Greek yogurt, but I didn’t have the whipping cream, so I just used some sweetened Greek style yogurt. After a long Sunday and a few days off from working out, I knew I was going to hit the gym hard on Monday and wanted something comforting for dinner. 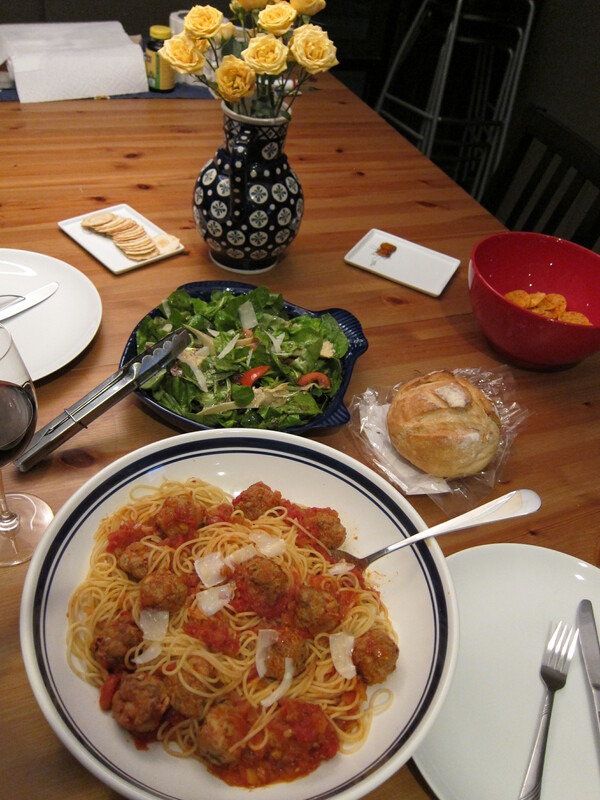 I actually have never made spaghetti and meatballs before, and my boyfriend loves pasta, so it was a easy decision. 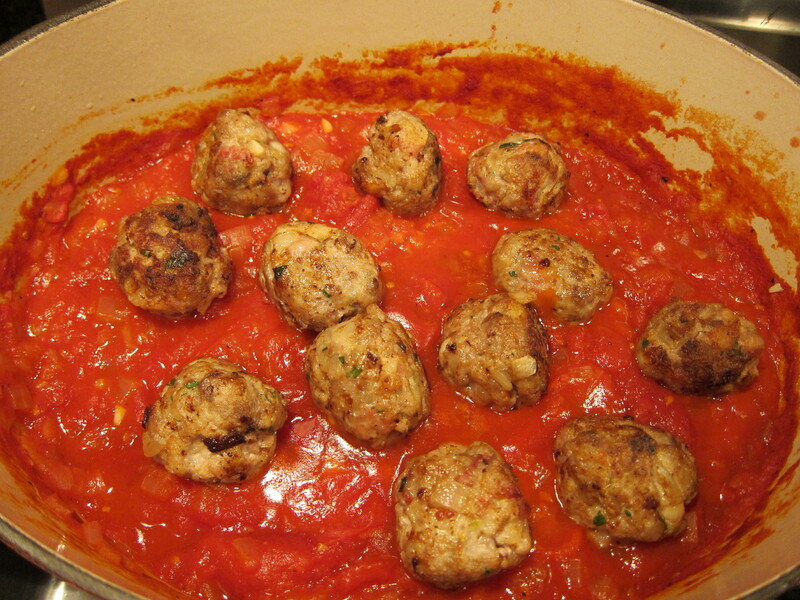 I like this recipe because you make the meatballs while the tomato sauce is simmering, and it all comes together at the end. You can also make the sauce or the meatballs ahead of time, and it’s a great left over dish for either pasta or meat ball subs the next day. 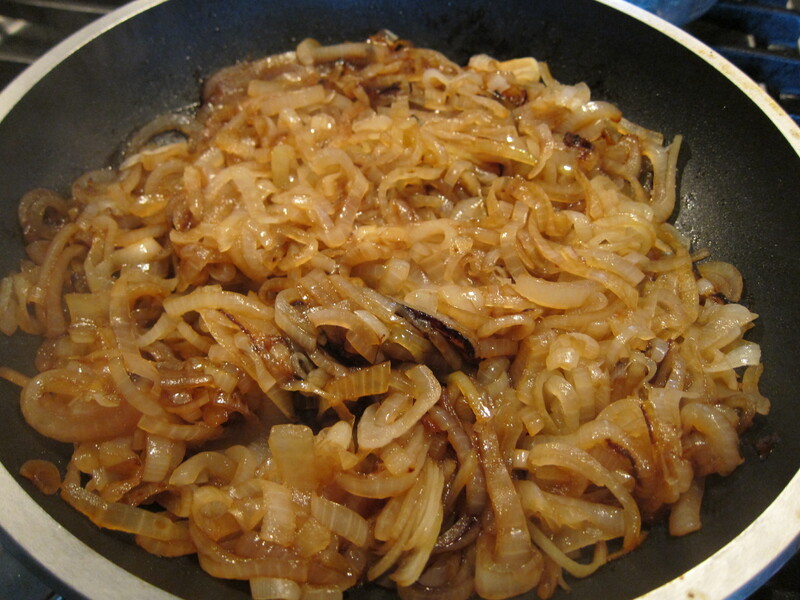 To make the sauce, some onions are cooked over medium low heat until translucent. 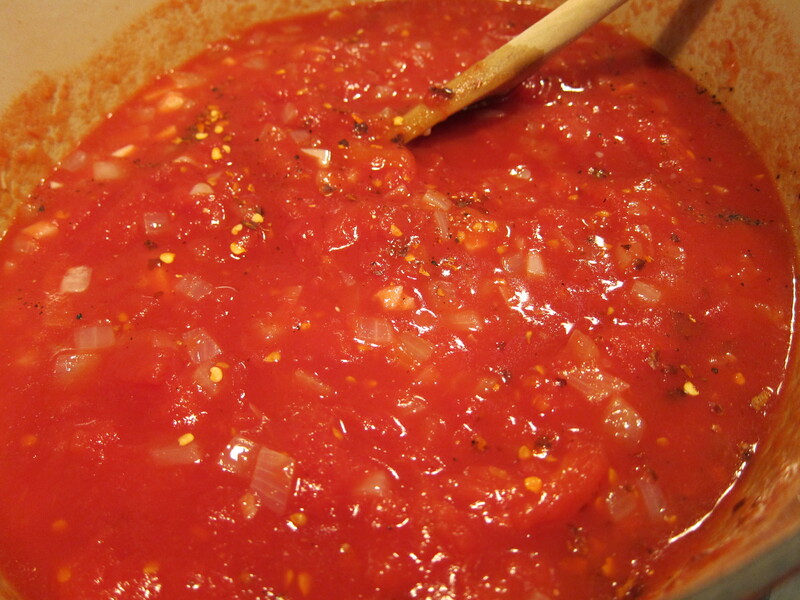 Then crushed tomatoes and garlic are added to the pot along with salt, pepper, and if you like heat, red chili flakes. The sauce is simmered slowly for about an hour. 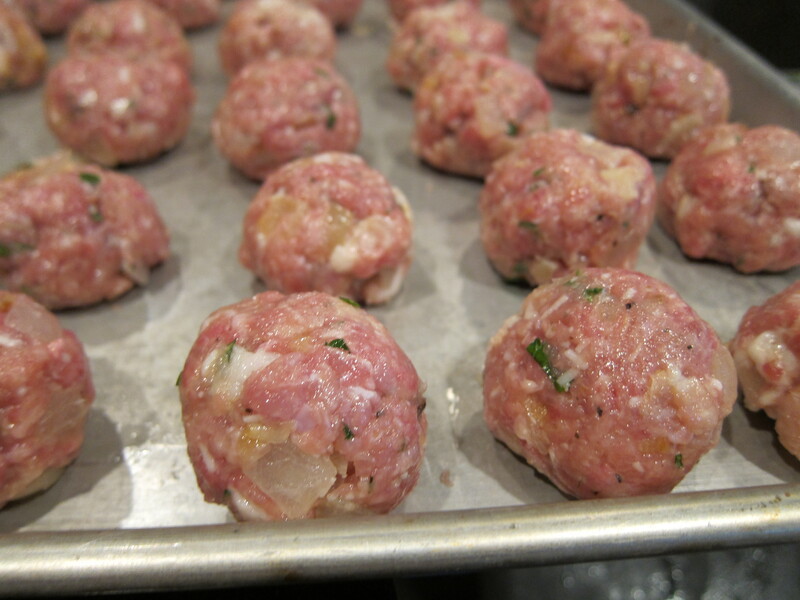 While the sauce is simmering, you can make the meatballs. One thing to note is that I only made 1/3 of the recipe for both the sauce and the meatballs. Even this was more than two meals for both of us. 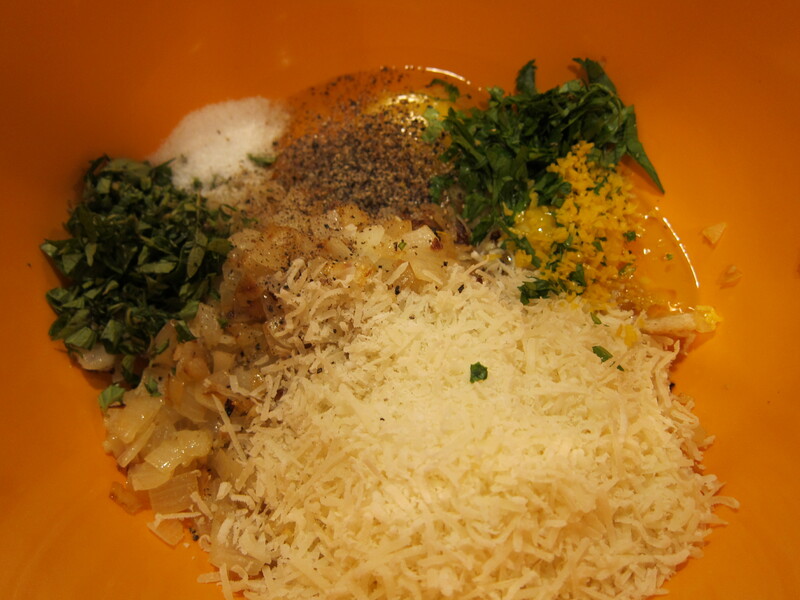 First, some eggs, Parmesan cheese, carmelized onion, milk soaked bread, chopped fresh Parsley and oregano, lemon zest, salt and pepper are mixed together. I like mixing by hand because it ensures even distribution. I like mixing by hand because it ensures even distribution. 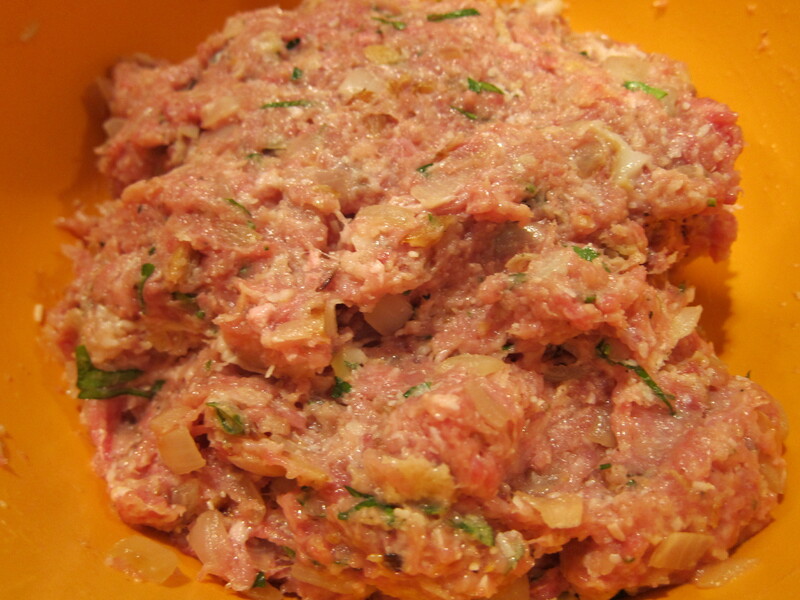 Next, ground chuck, ground pork, and ground veal are added. 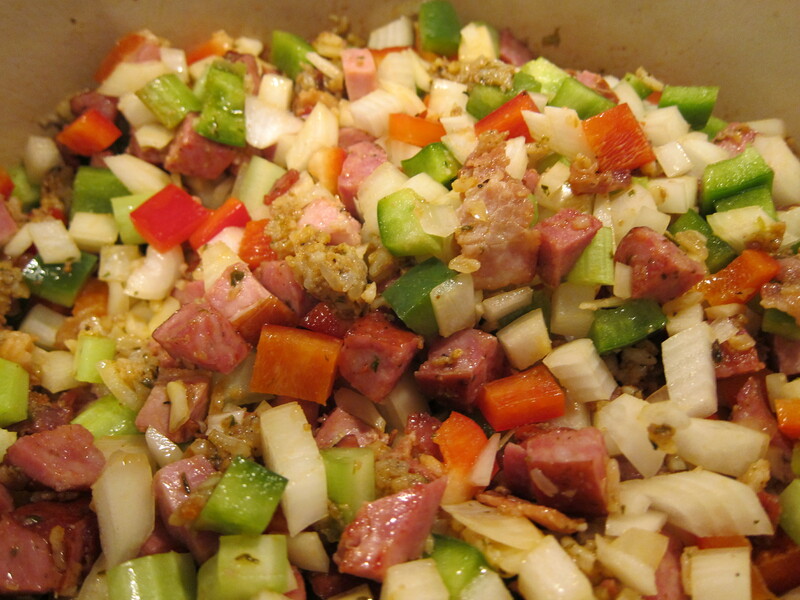 I also finely chopped some bacon and added them to the mix. 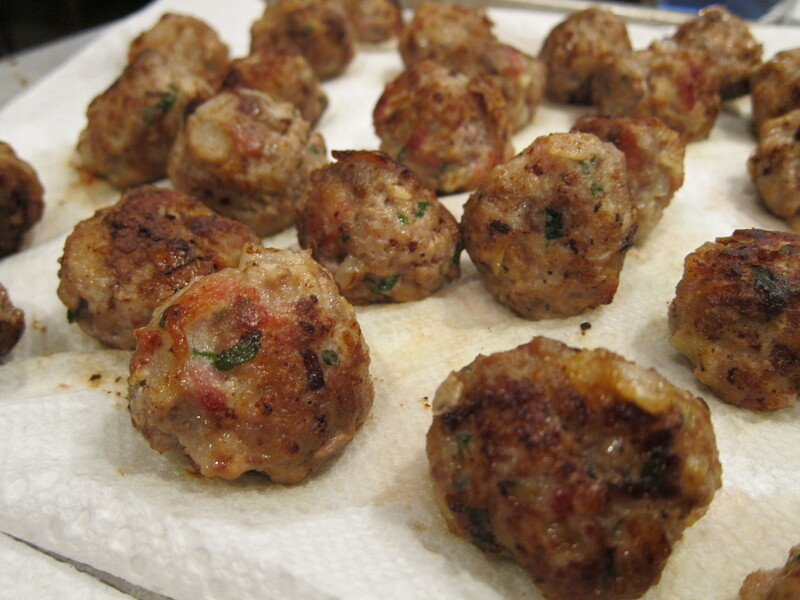 This is not a part of the recipe, but I thought the fat from the bacon would keep the meatballs moist. The meatballs are formed into ping-pong sized rounds with wet hands, any bigger would make them hard to cook through and eat. 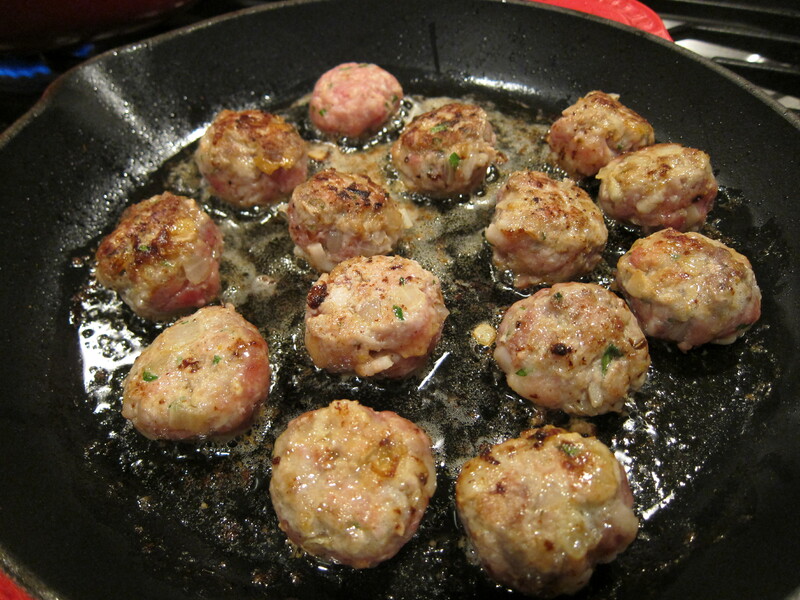 The meatballs are browned in a pan with about 1/4 inch of olive oil on medium heat. It’s important to not crowd the pan, so the meatballs should be cooked in batches. Also it’s helpful to observe the browness of the meatballs and adjust the heat as you go along. They don’t have to be cooked completely at this point, just browned on the outside. The meatballs are drained on paper towels first. This will ensure the meatballs aren’t too greasy before they go into the sauce, and it will keep the sauce from becoming too oily. 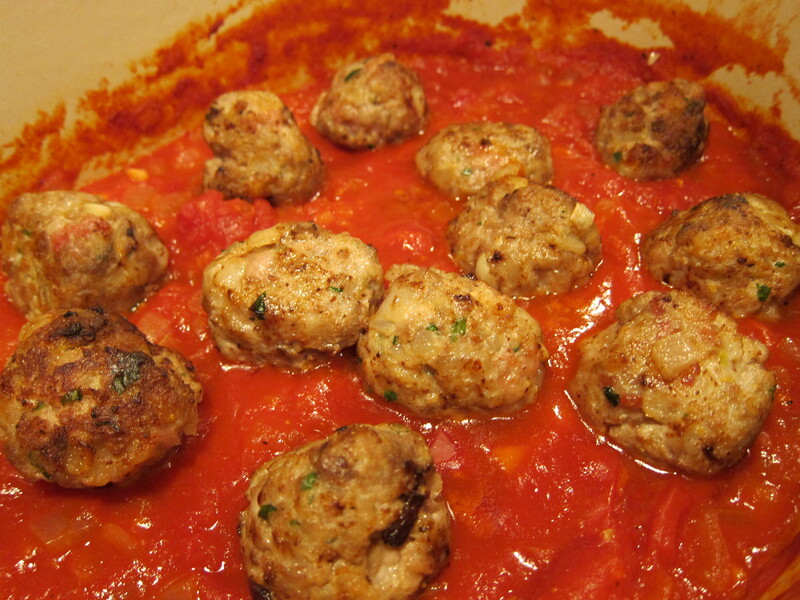 The meatballs are placed into the tomato sauce and simmered for 30-40 minutes. 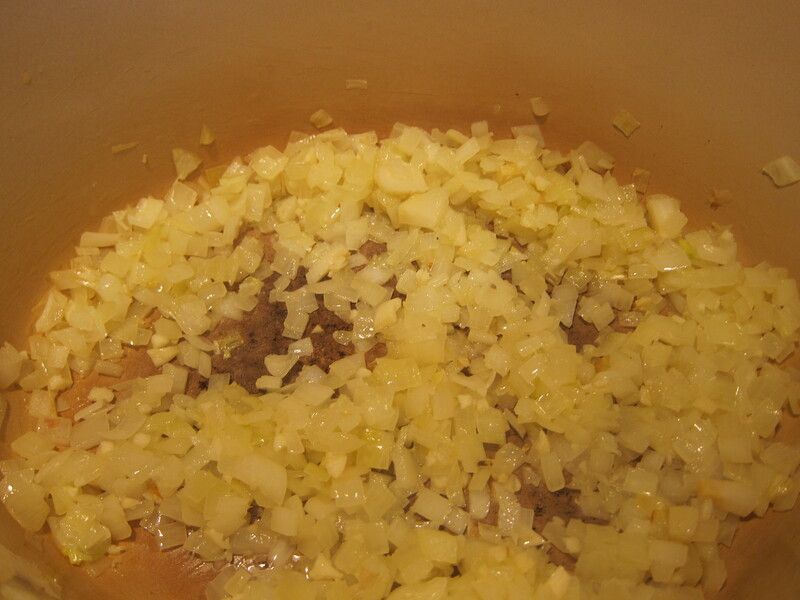 If it gets too dry, you can add some stock to thin the sauce down. About 15 minutes before you are ready to serve the dish, you can start on the pasta, cooking per package instructions. 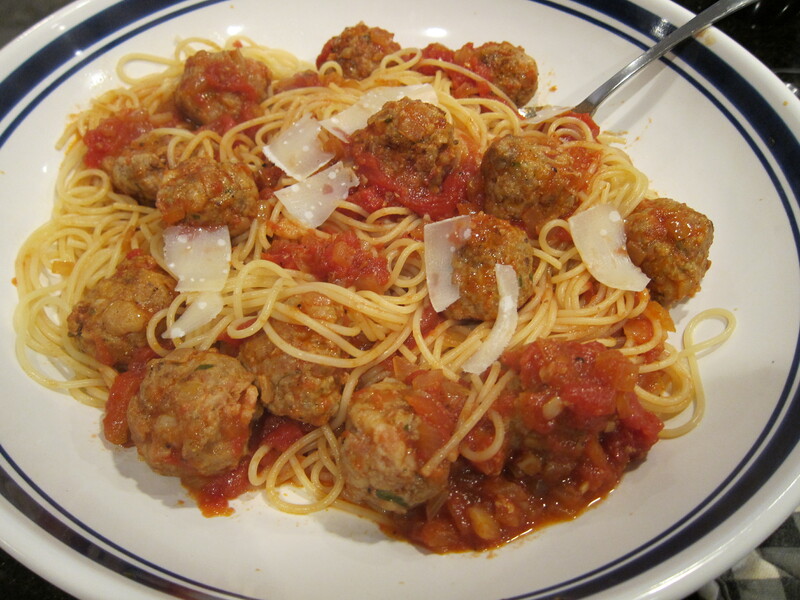 The sauce and meatballs are mixed in with drained Spaghetti, and I like to put a little bit of shaved Parmesan on top. I completed the meal with a simple arugula, bibb lettuce, tomato, and heart of artichoke salad, as well as some store bought Italian bread. One of my boyfriend and I’s hobby is photography, and this Sunday we had a big shoot with 4 models and 5 makeup and hair stylists. I offered to make breakfast for everyone, and I had to take into consideration of vegetarians, as well as the fact that we have a long day ahead of us and possibly no time for lunch. 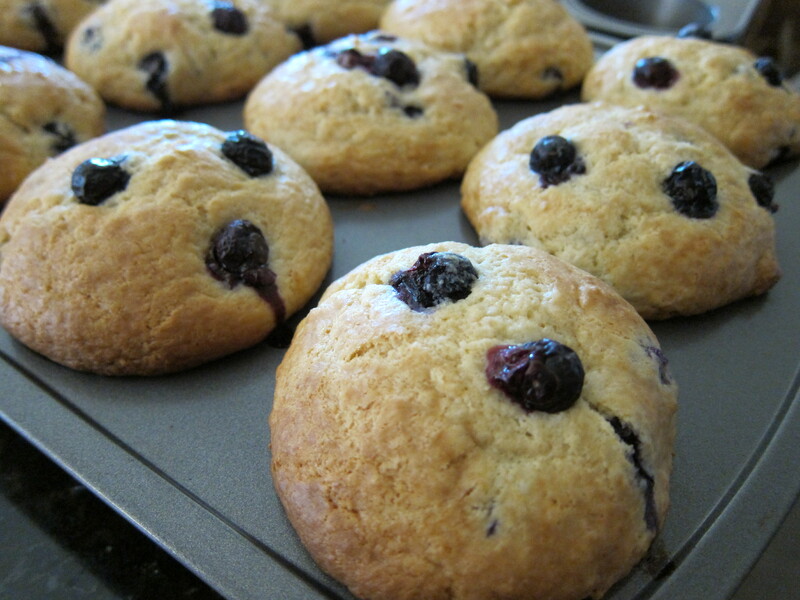 To start with, I made blueberry muffins from a Flour recipe. These can be made a day early and will stay good in room temperature for 3 days. 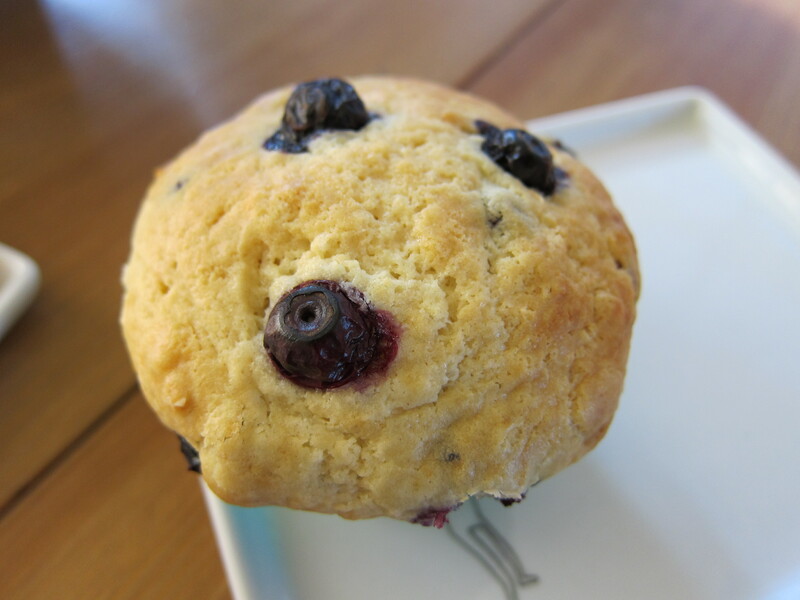 I love baking muffins because my house always smells so good afterwards, it’s probably why people make food scented candles. 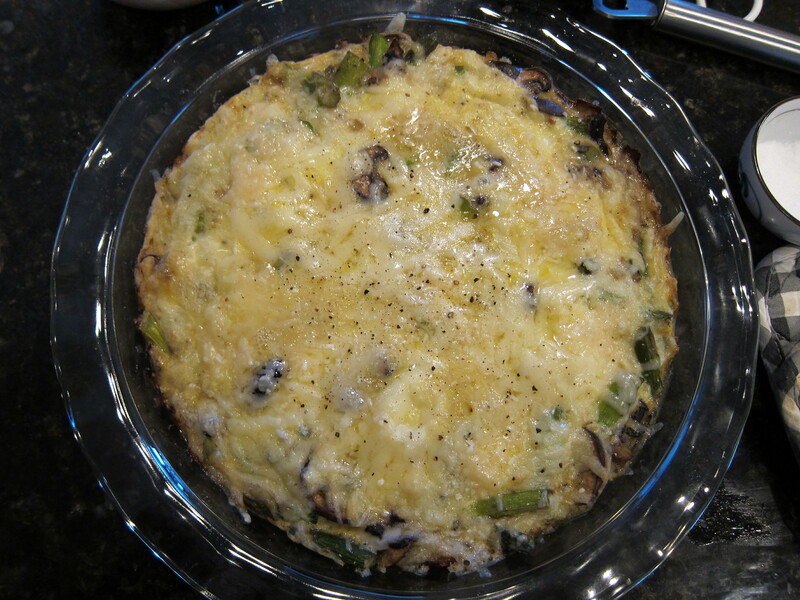 For the meat eaters, I made a Frittata, which a baked Spanish omelet-like dish, with Proscuitto and Peas, and for the none meat eaters, I made one of leek and asparagus. A Frittata usually consists of vegetable and eggs, which is packed with energy, and makes the reason frittatas are a popular brunch dish. 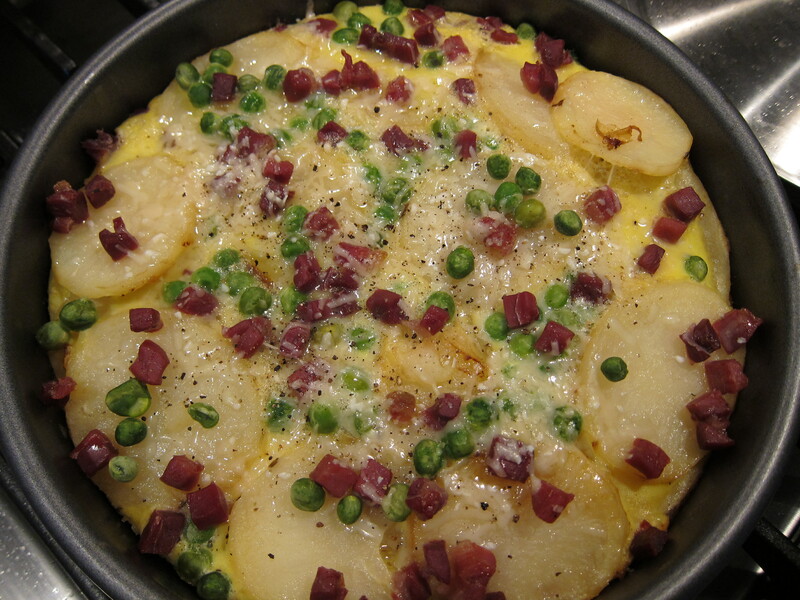 For Proscuitto frittata, some sliced potatoes are sauteed in a pan for about 20 minutes until tender, on medium heat. Then some eggs are beaten with salt and pepper, and placed in the bottom of a baking pan. 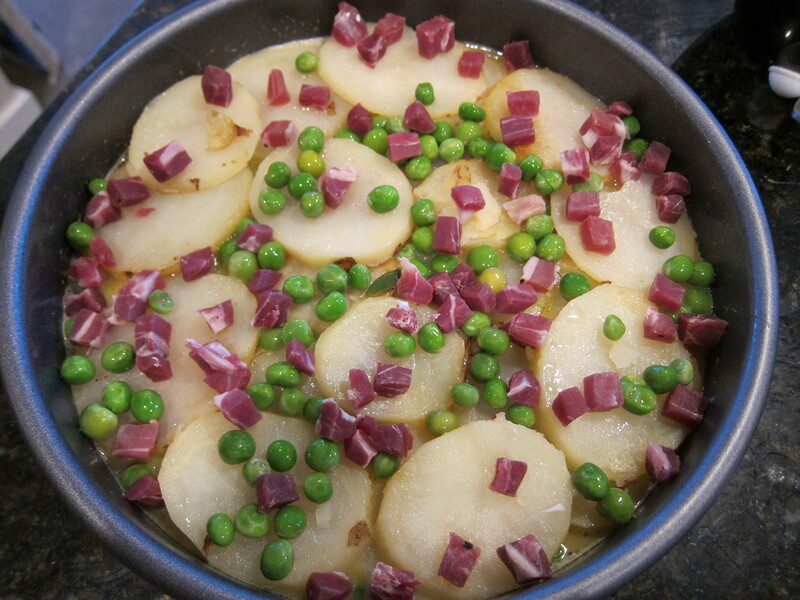 Half of the potato slices are placed in the pan evenly, and chopped pieces of proscuitto and peas are spinkled throughout the pan. 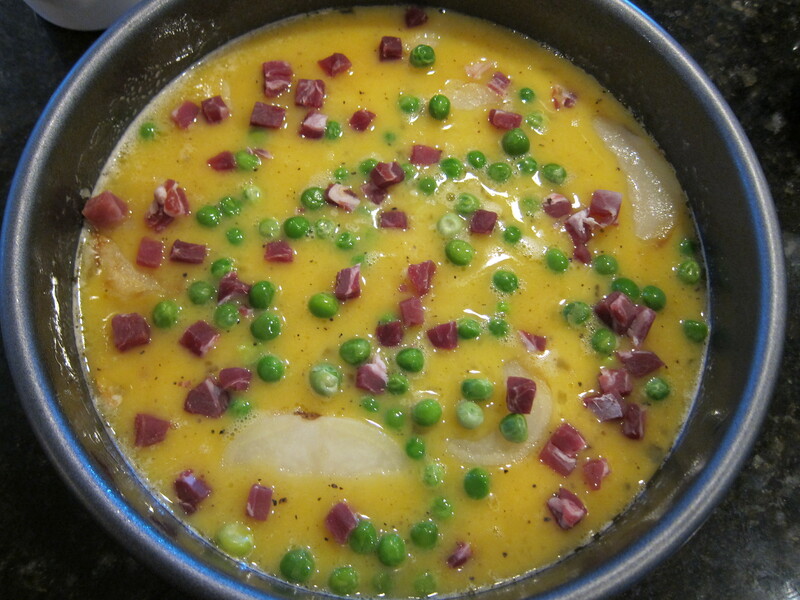 Then the process is repeated with the remainder of the potatoes, proscuitto, and peas. It’s okay if the eggs mixture don’t come all the way up to the potatoes, since it will puff up during baking. The pan is put into the oven and baked for 18-20 minutes on 375F. It’s done when eggs are all puffy and set. I sprinkled some Parmesan cheese on top near the end of the baking process. 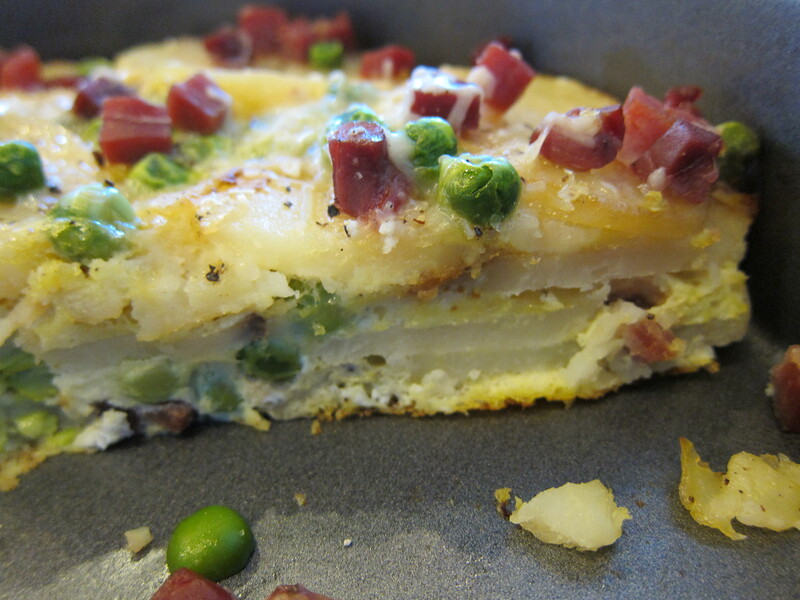 I love the cross section view of the Frittata to appreciate all the layers of potatoes and eggs. For the Leek and Asparagus Frittata, I substituted the leeks with some spring onions, because leeks were only sold in threes at the supermarket and I didn’t have any recipes in mind to make the rest with. 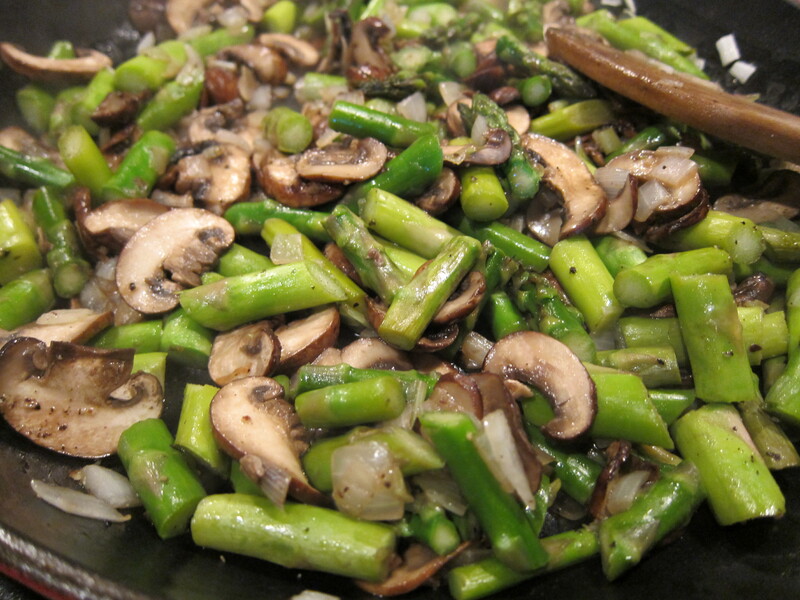 The spring onion and the Asparagus are sauteed with some mushrooms. The recipe called for Shitake, but I just used Crimini. After the vegetables are tender, they are put into a baking dish, covered with a mixture of eggs and Fontina cheese (I substituted Swiss). The recipe actually calls for the dish to be cooked on stove top until the eggs are almost set, but since I was baking the Proscuitto Frittata anyways, I just stuck it in the oven for the same time. After baking, the dish can be served right away or at room temperature, which was great because we had people coming in and out at different times, and both Frittatas can be eaten at any time. We had a Friday lunch meeting at our place, and I made easy Quesadillas from store bought rotisserie chicken, caramelized onion, and Jack cheese blend. 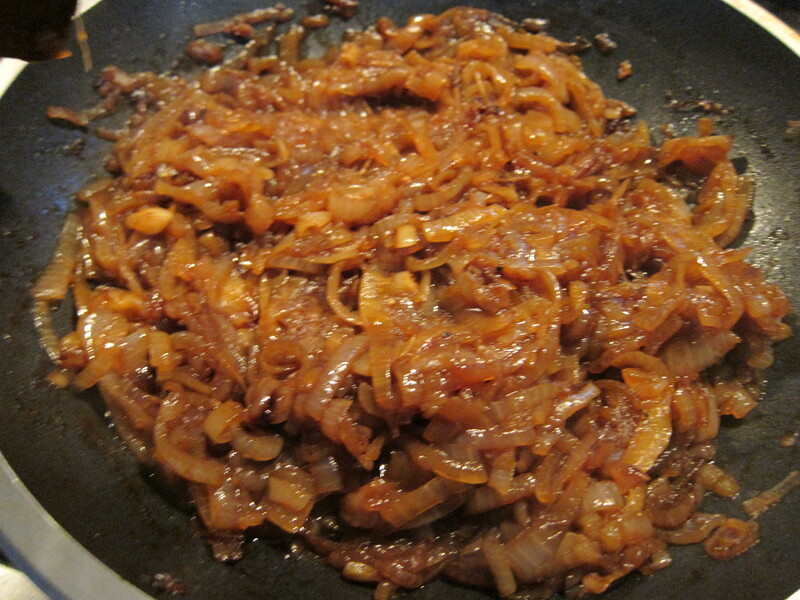 I love caramelized onion because it’s so versatile and delicious. It’s also very cheap and simple to make, just requires some patience. 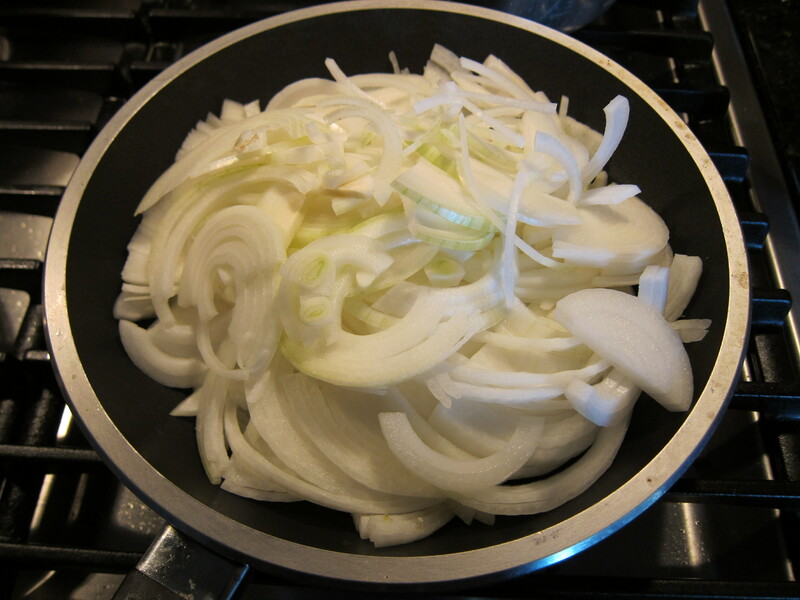 First onions are sliced and stuck into a pot, covered, over low heat. Do not disturb the pot by stirring. After about 10 minutes, you can see that the bottom of the pot is starting to brown just a little bit, and the onions are softened on top. Do not disturb the pot, cover, and keep cooking. After another 10 minutes, the onions should be nicely browned on the bottom, now is the time to stir the onions, and keep cooking with the pot uncovered. 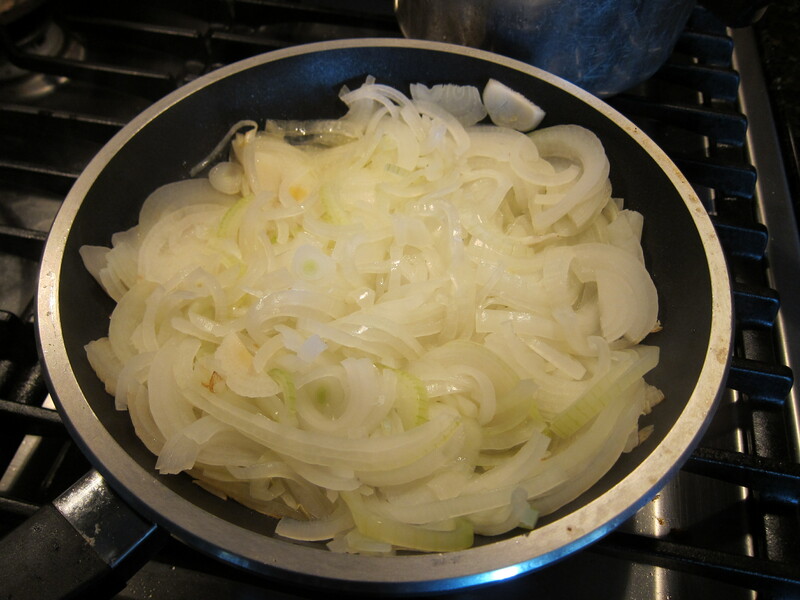 After about 5 to 10 minutes more, the onions will be ready to use. 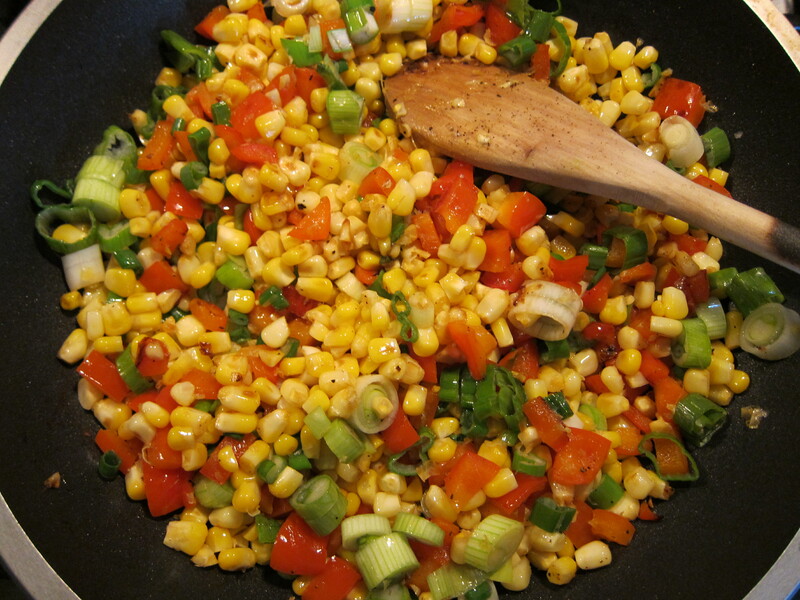 Since there was a vegetarian at the lunch meeting, I made some sauteed fresh corn, red bell pepper, and green onions. 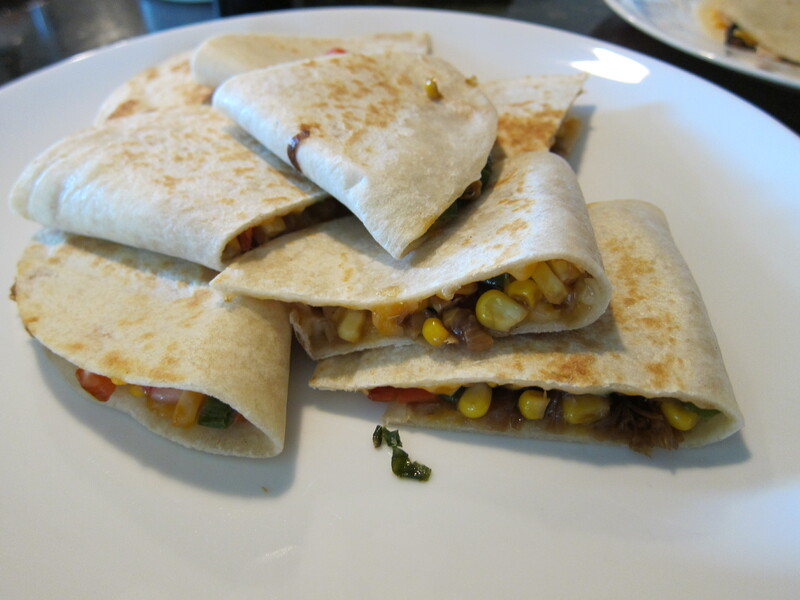 The vegetarian Quesadilla had the vegetable mix, some caramelized onion, and jack and cheddar cheese combo on flour tortilla. 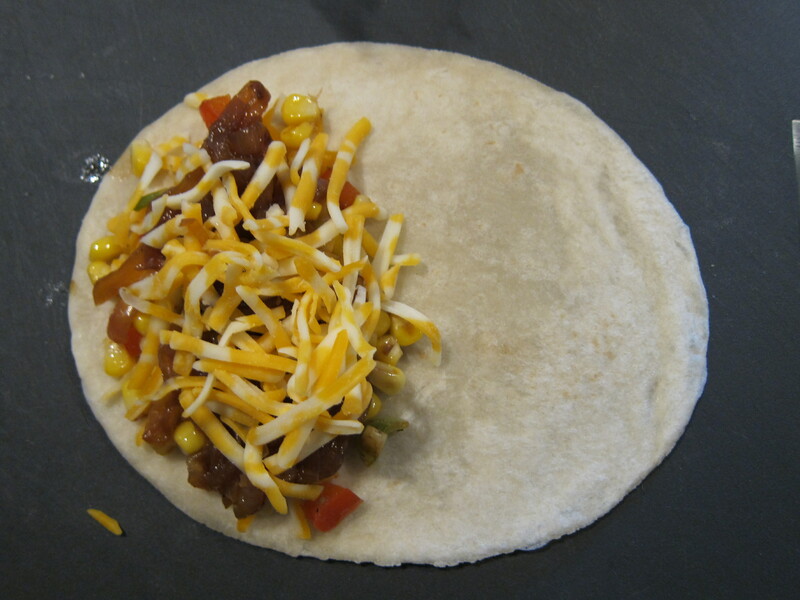 Then the Quesadilla is warmed on a hot pan until the cheese has melted. 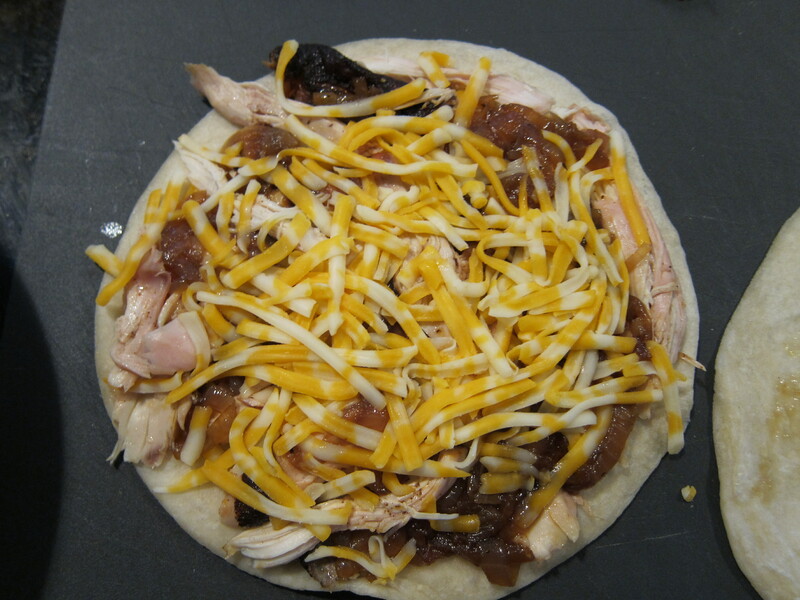 The chicken Quesadillas had shredded chicken, caramelized onions, and jack and cheddar cheese combo. It turned out to be a quick, easy, and delicious lunch. For Saturday morning breakfast, I wanted to reuse the left over chicken and corn, red bell pepper, and green onion vegetable mix. 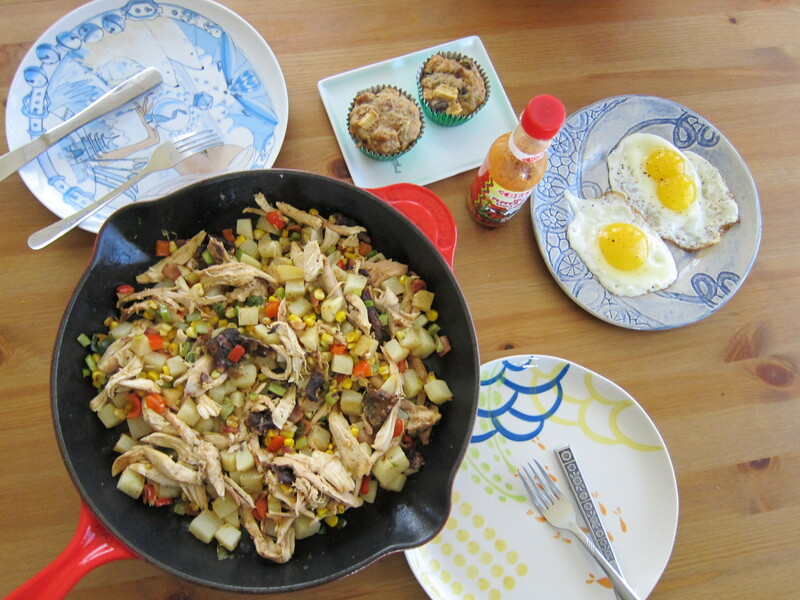 I found a recipe online for chicken hash, and I tweaked the recipe a bit to incorporate the ingredients I already had. 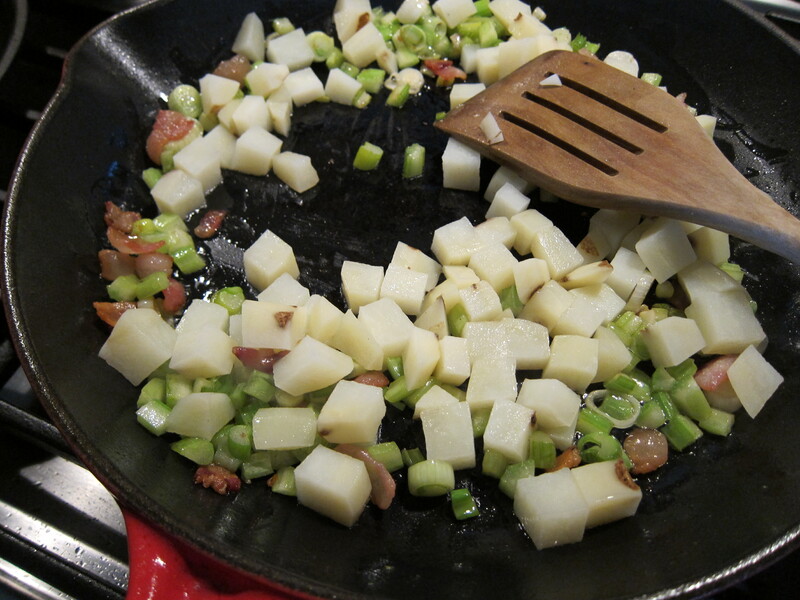 First I fried up a chopped up slice of bacon with some chopped celery, then I added some boiled cubed potato to the pan. 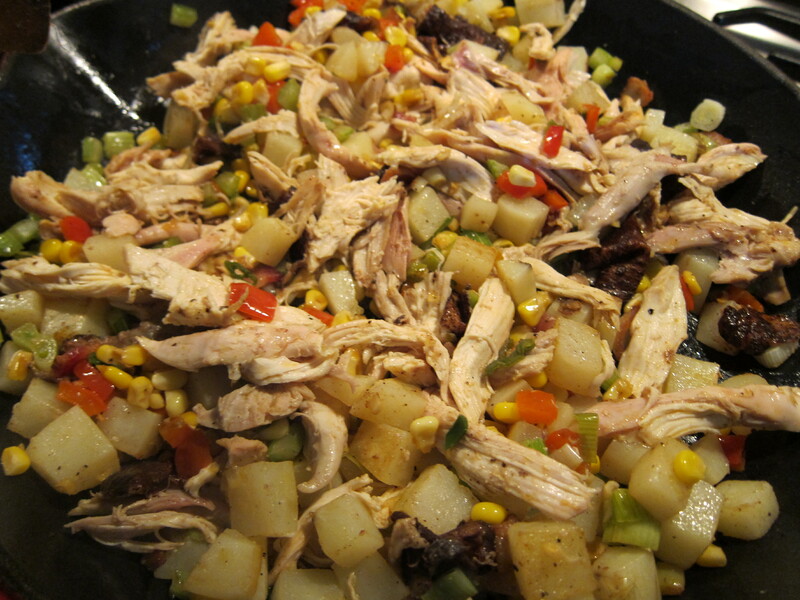 Then the chicken is added along with the corn, red bell pepper, and green onion vegetable mix. I served the hash with some hot sauce. 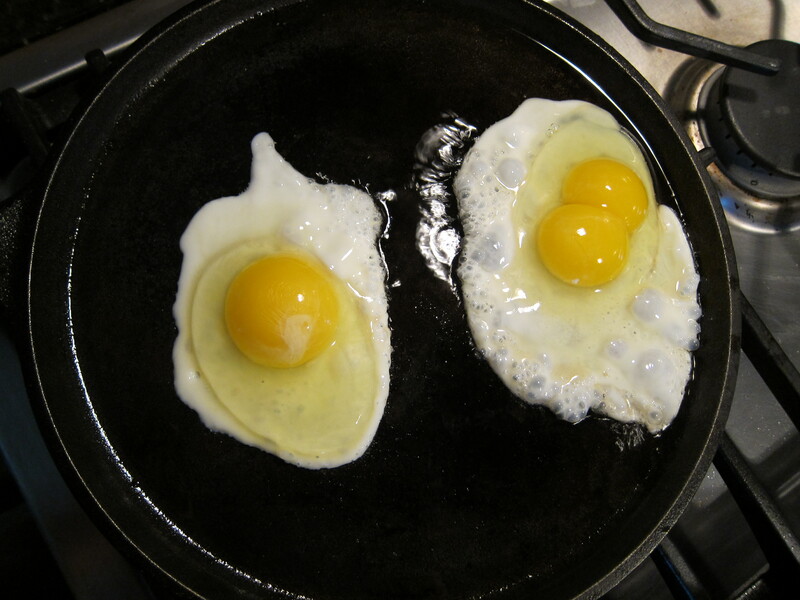 I also made some fried eggs and one of them had a double yoke! One lunch turned into two meals! There is a Taiwanese place in Dallas called Genroku that serves Three Cup Chicken, a great Taiwanese staple. 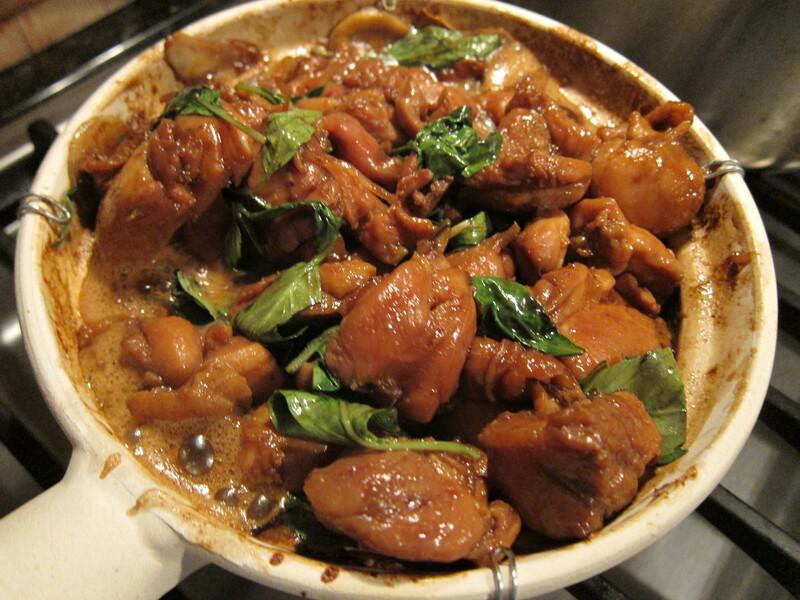 The chicken is served sizzling in a claypot, with ginger, garlic, and Thai basil, along with the sweet and salty three cup sauce. The dish originated from southern China, where the “three cups” consists of soy sauce, rice wine, and sesame oil. The Taiwanese dish uses soy sauce, sugar, and sesame oil, and Thai basil. I found a pretty easy and simple recipe on Rasamalaysia.com, where the three cups are soy sauce, Kecap Manis (Malaysian sweet soysauce), and Shaoxing wine. 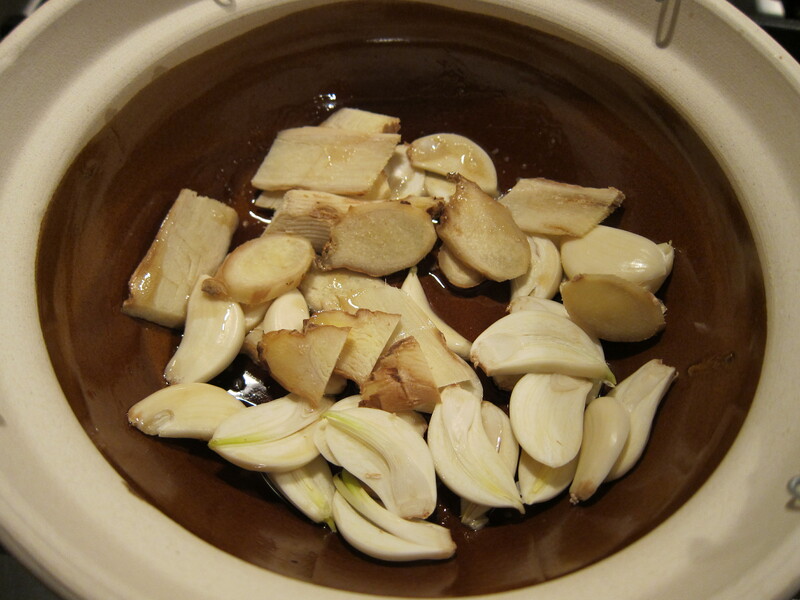 First, ginger and garlic are fried up in the clay pot with some sesame oil. Then the chicken is added to the hot pot, and cooked until white. The recipe calls for the chicken to be marinated in baking soda for 10 minutes, which makes the chicken real tender. I would recommend not skipping this step. The sauce is added to the chicken and the pot covered and cooked for 10 minutes until the sauce is reduced. Then basil is added to the dish and stirred in to finish up the dish. While looking at Rasamalaysia’s recipe index, I found this recipe for Shrimp dumplings that looked fairly simple and fast. 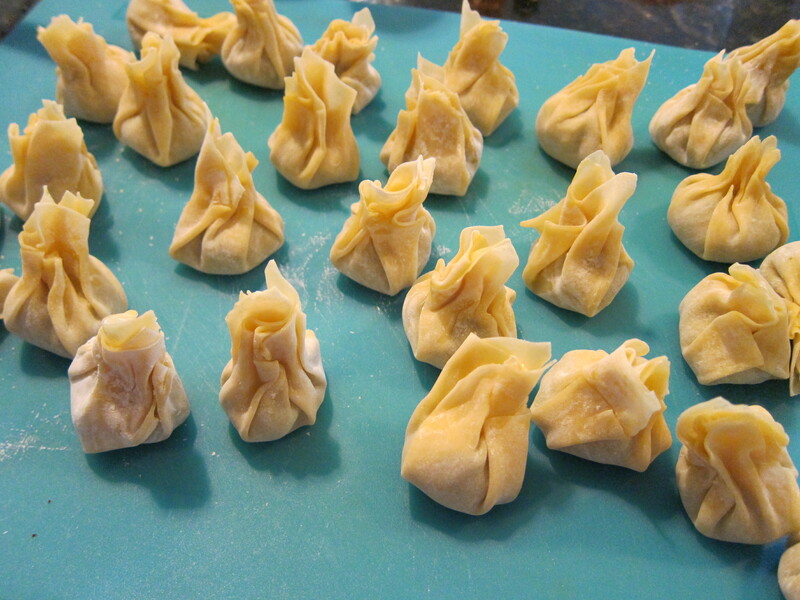 You can make the dumplings early and freeze them ahead of time. 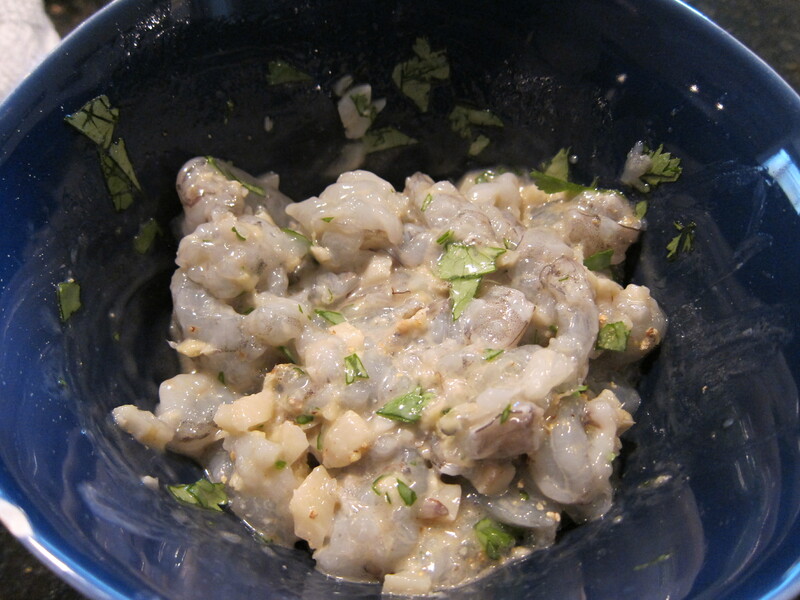 The filling is made out of chopped shrimp, water chestnuts, and cilantro leaves. I used pre-purchased wonton skin, which I got from the local Asian market. You can purchase them from central market as well. 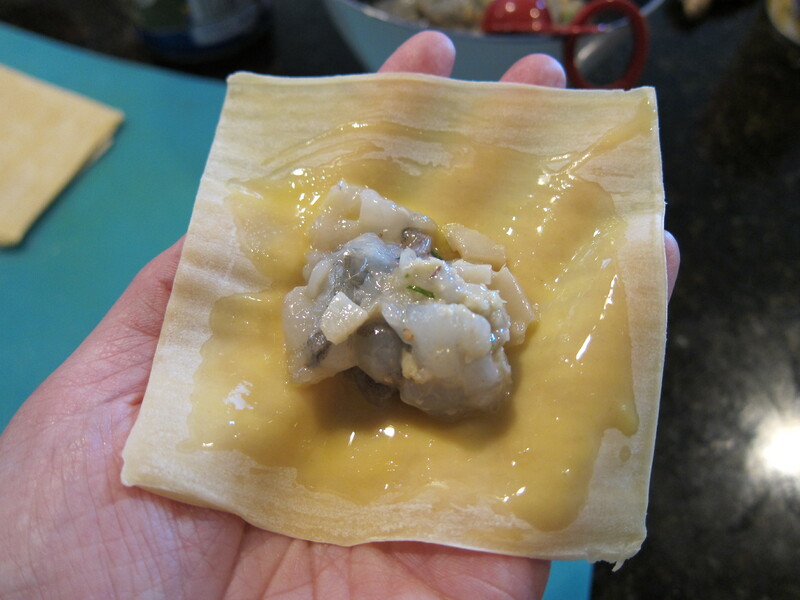 I brushed some egg on the wonton skin, and put a teaspoonful of shrimp filling in the middle of the wonton skin. I made a cup form with my hand and took two opposite edges of wonton skin and pulled it together, then I gathered the other two corners and squeezed together. 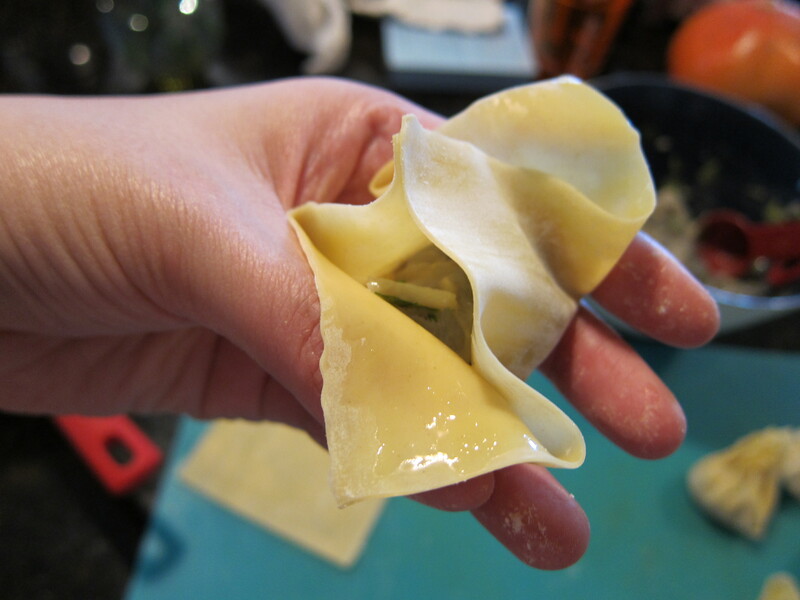 To secure the wonton, I lightly twisted the wonton skin end. 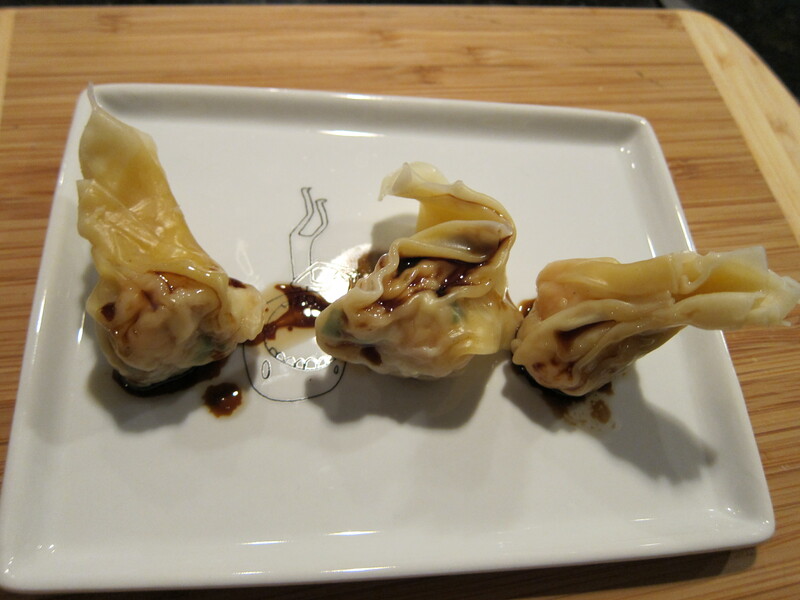 The egg will help stick the wonton skin together. 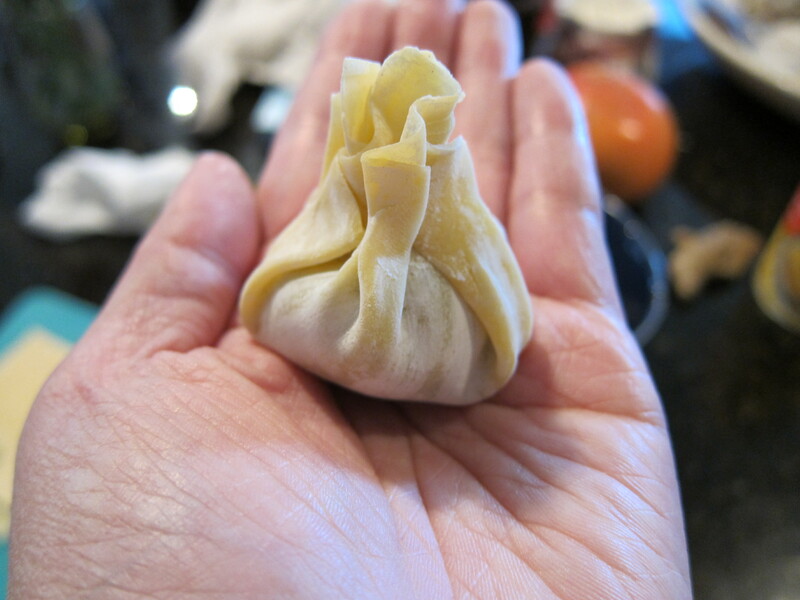 The dumplings can be frozen at this point or placed in the fridge for cooking later in the day. You want to put some flour on whatever surface you leave the dumplings on because the wonton skin will stick other wise. The dumplings only take a couple minutes to cook in boiling water. Rasamalaysia also provides two recipes for dumpling dipping sauce. I made the more traditional soy sauce, black vinegar, ginger one. 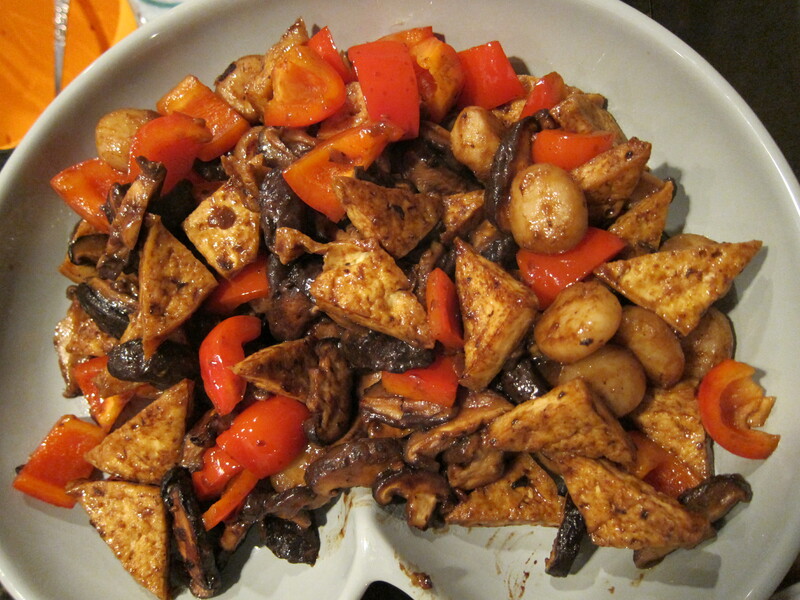 To finish up the menu, I decided to make Home style tofu, which is also very simple and quick stir fry dish. You can purchase fried tofu at Asian supermarkets, but I decided to make my own. Firm tofu is the type you want to use to make your own. 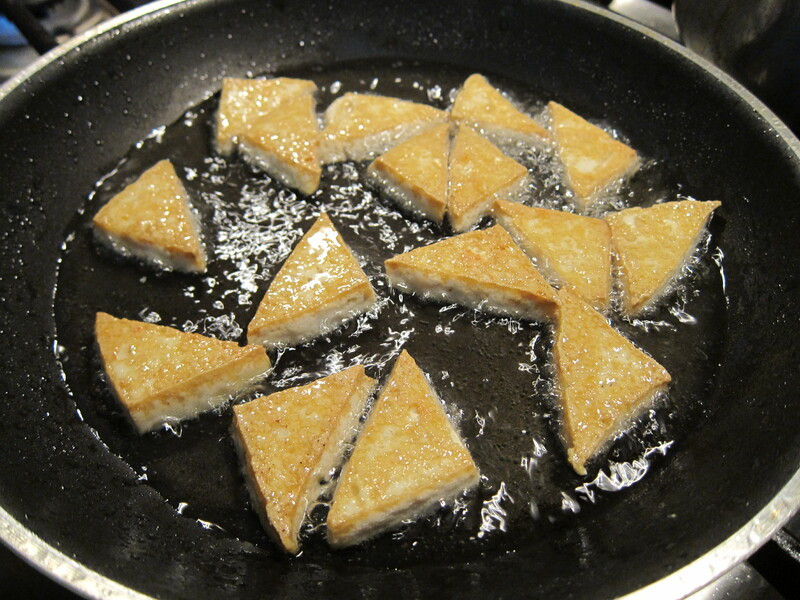 The tofu fried in medium heat until golden; the process takes about 5 minutes per side depending on your stove. Drain the tofu on some paper towels and it’s ready to use. Some recipes for home style tofu calls for meat, but since I already have chicken and shrimp on the menu, I decided to use fresh shitake mushrooms instead. 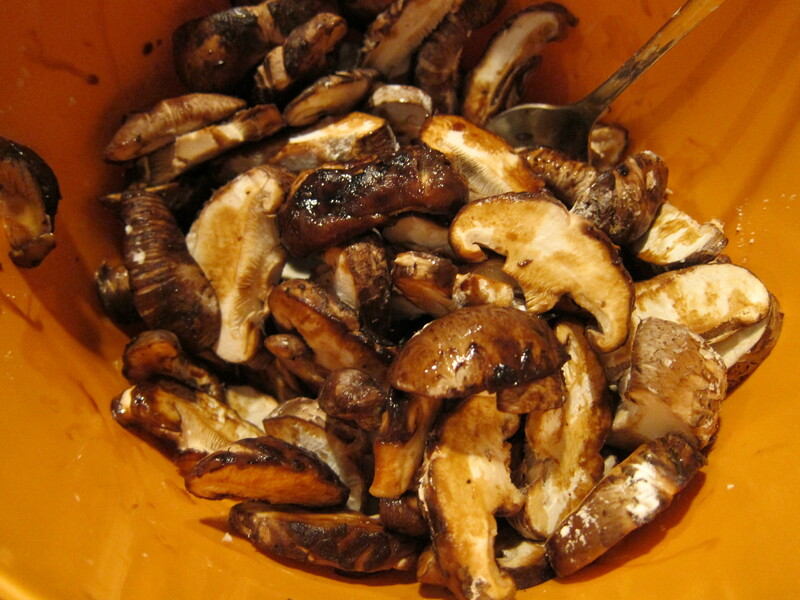 I stirred the sliced mushrooms in some soy sauce and corn starch. 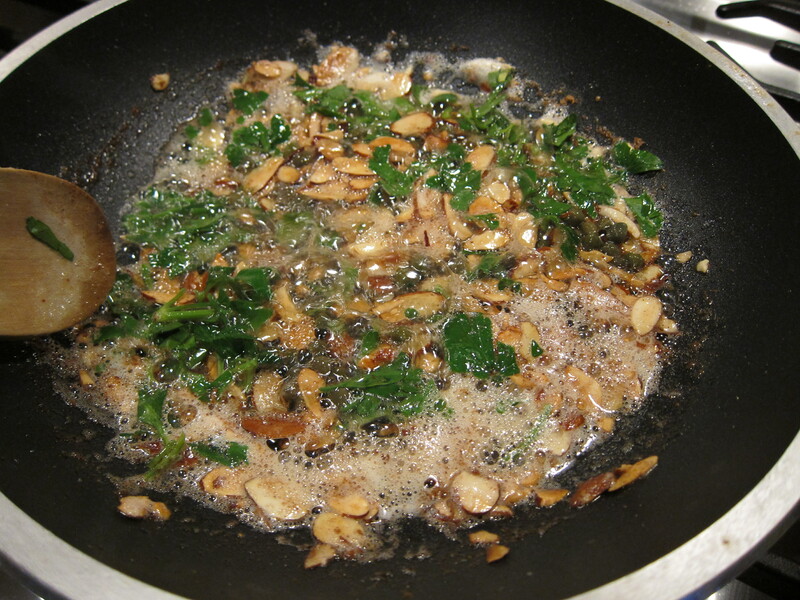 To make the dish, I first fried some broad bean sauce in hot oil in a wok for 20 seconds or until fragrant. 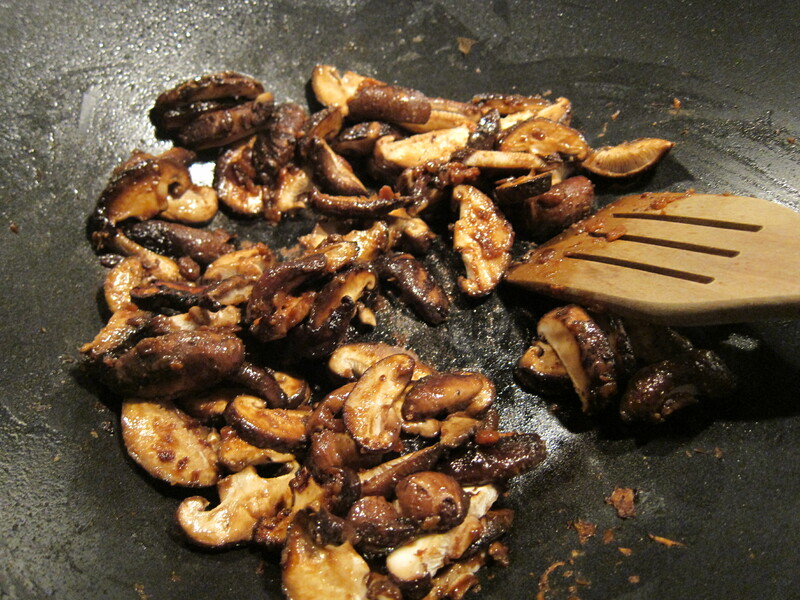 Then I added the mushrooms and stir fried until soft. 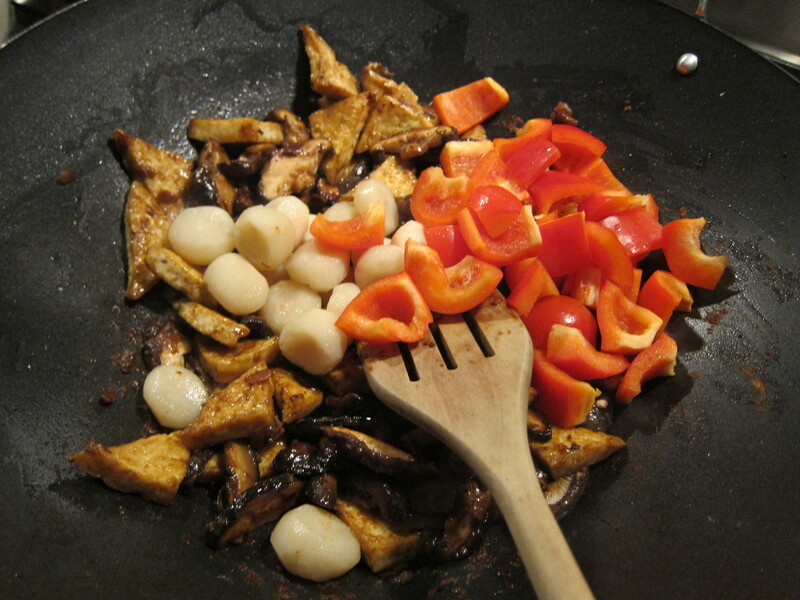 Then the fried tofu and red bell peppers are added to the wok; I also added the left over water chestnuts from the shrimp dumpling recipe. The dish takes about a few more minutes to complete in the wok. If there is too much stuff stuck to the bottom of the wok, add a little bit of water or broth to soften. I was looking for something fast to cook for a weekday dinner, and I came across this Swordfish Piccata recipe by John Besh, chef and owner of August in NOLA. 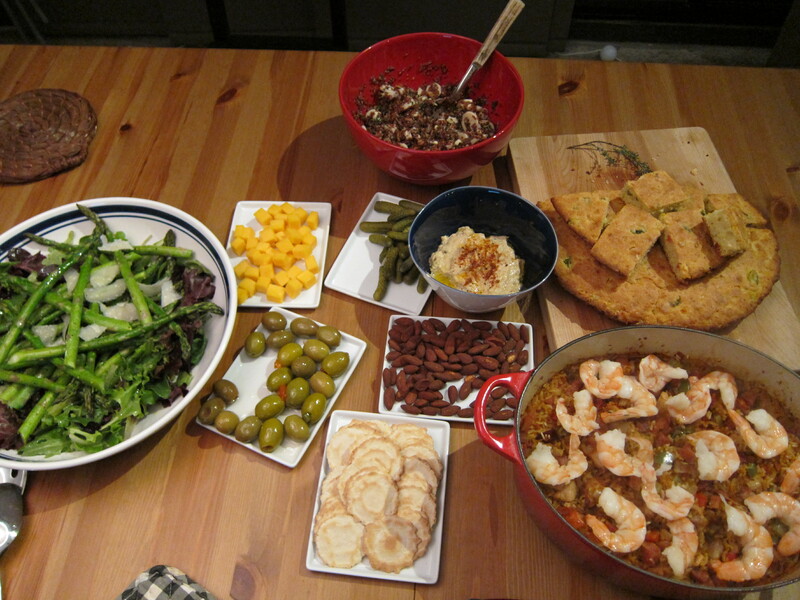 I’ve seen John Besh on Top Chef before, but I’ve not tried any of his recipe before, and since it is Mardi Gras week, it seemed fitting to make something from a NOLA chef. 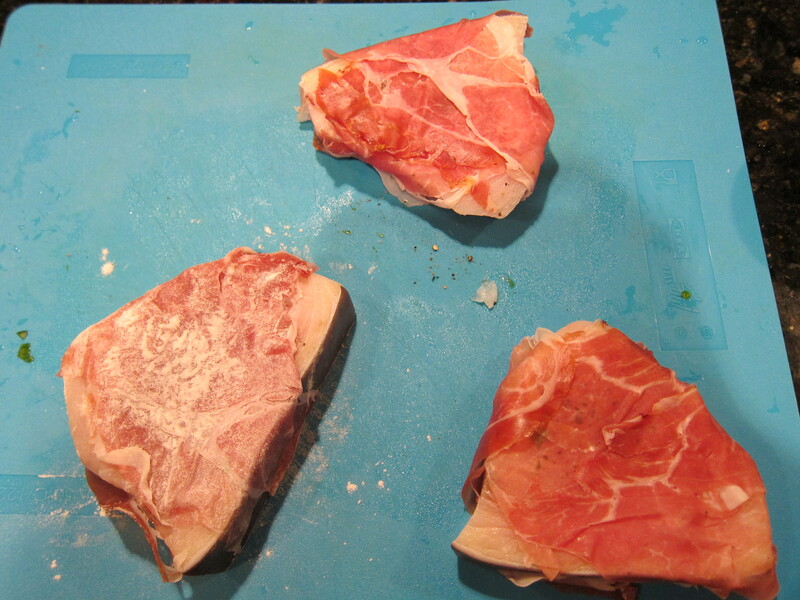 The swordfish is first seasoned lightly with salt and pepper, then wrapped in super thin slices of Proscuitto. 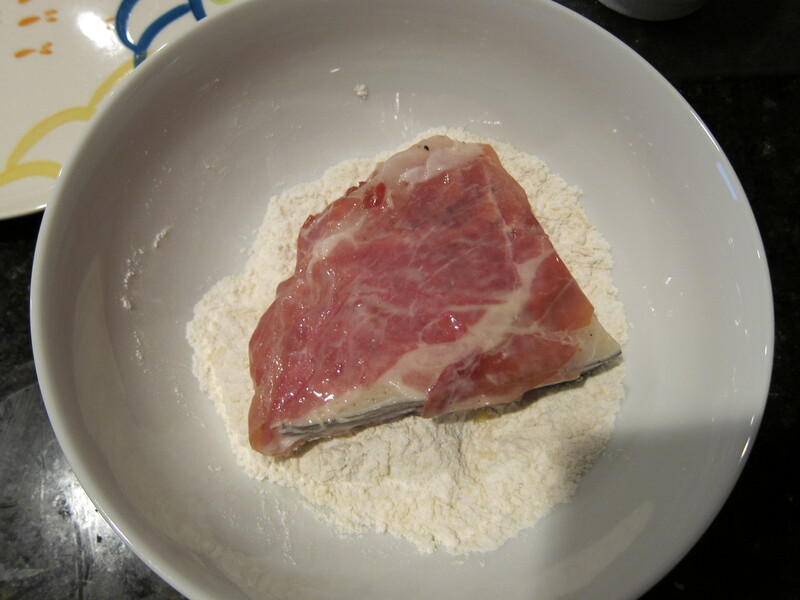 The Proscuitto helps keep the fish moist, and I used two slices per swordfish steak. 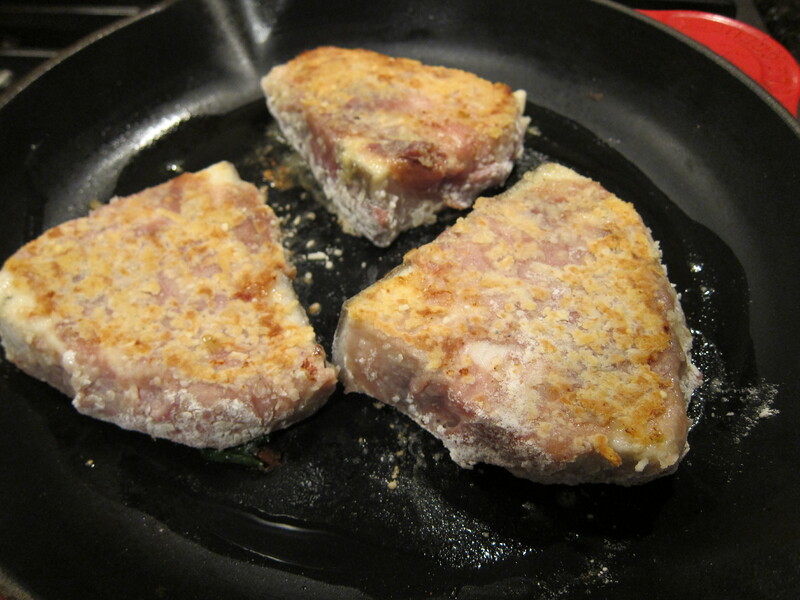 The swordfish steak is lightly dusted in flour, which will help the batter stick in the next step. The steak is first dipped in a mixture of egg and milk, letting the extra liquids drip off, then the steak is placed in a mixture of flour and parmesan cheese, pressing on the steak to make sure the cheese adheres. The fish steaks are placed in a hot pan and seared for 3 minutes until the underside is lightly browned. Then the pan is put into the oven for 5 minutes for the fish to finish cooking. 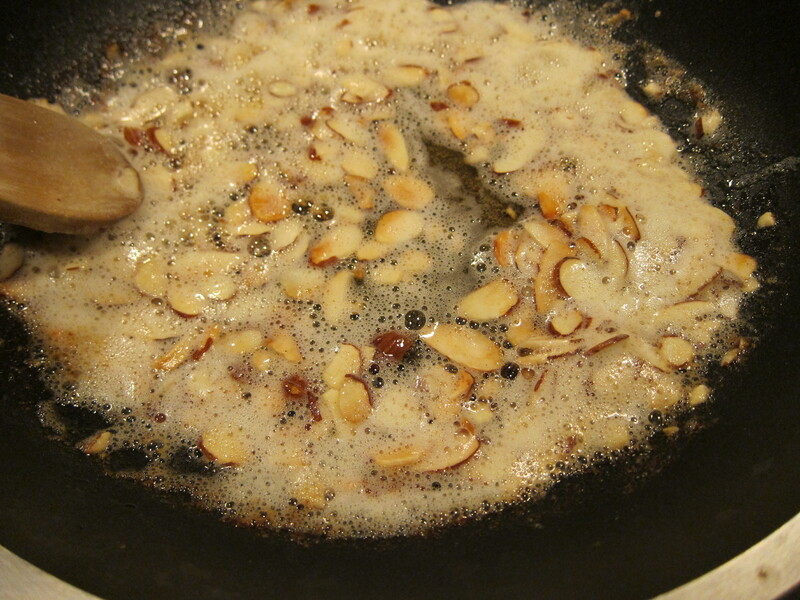 To finish up the Piccata, sliced almonds are sauteed in butter on medium heat until the almonds and the butter brown a bit. 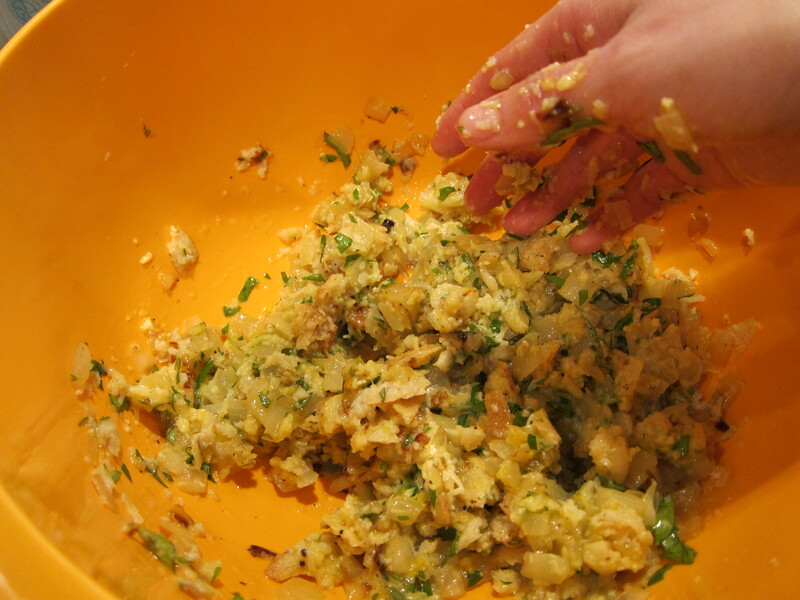 Then the sauce is taken off the heat and lemon juice, capers, and parsley are tossed into the pan. The sauce is then spooned over the finished fish steaks. 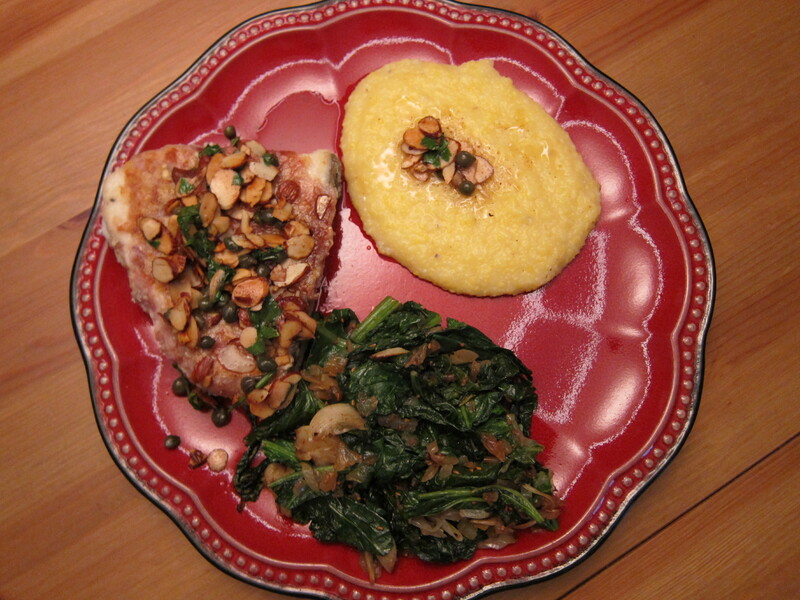 To go with the fish, the recipe recommended sauteed kale and polenta. 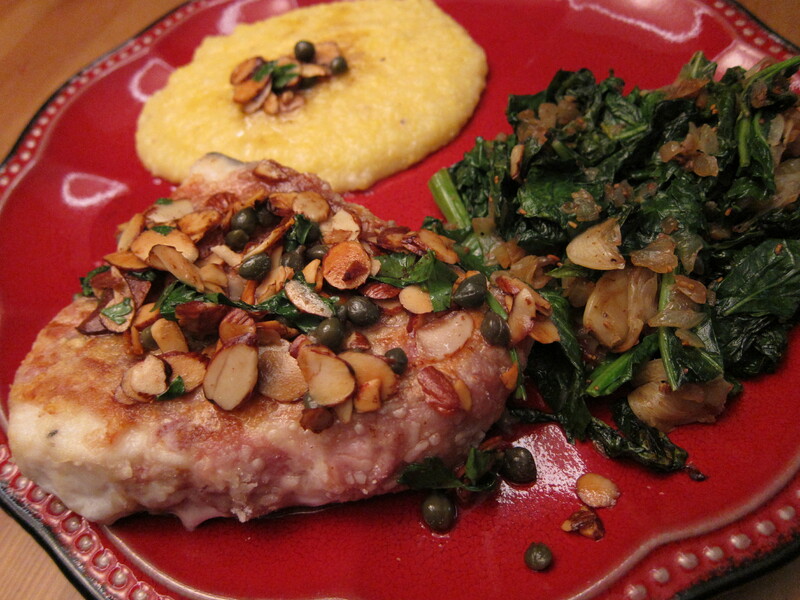 I found a kale recipe by Richard Blais and a simple polenta recipe. 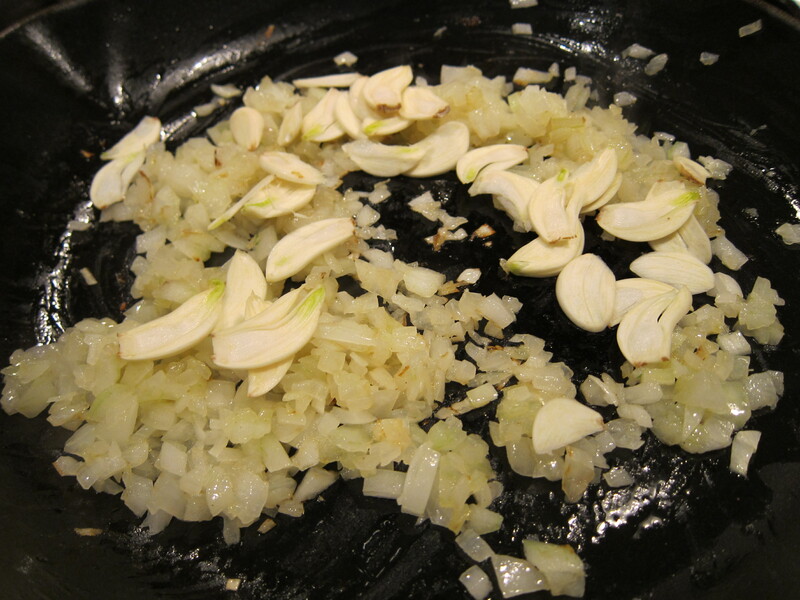 To make the Kale, some onions are browned in a pan with some sliced garlic. 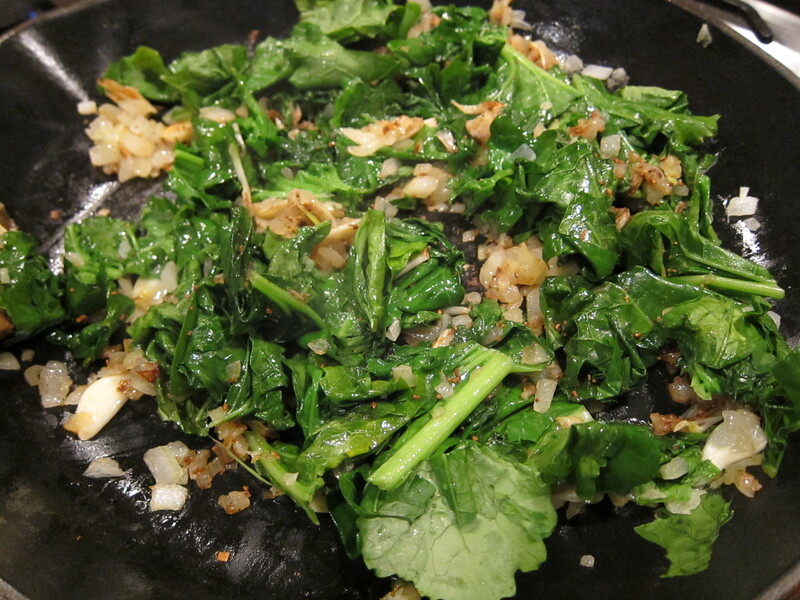 Then the Kale is added to the pan with grounded caraway seeds, and cooked until soft. Finally some pickling juice for hot peppers is added to the pan. The recipe tells you how to make your own, but I just used some pickling juices from a Momofuku bird chili pickle recipe, which worked out really well. I paired dinner with some white Cote Du Rhone, and it was actually quite fancy for a week night dinner. Biryani is a rice based food made with spices, Basmati rice, and meat or vegetables. 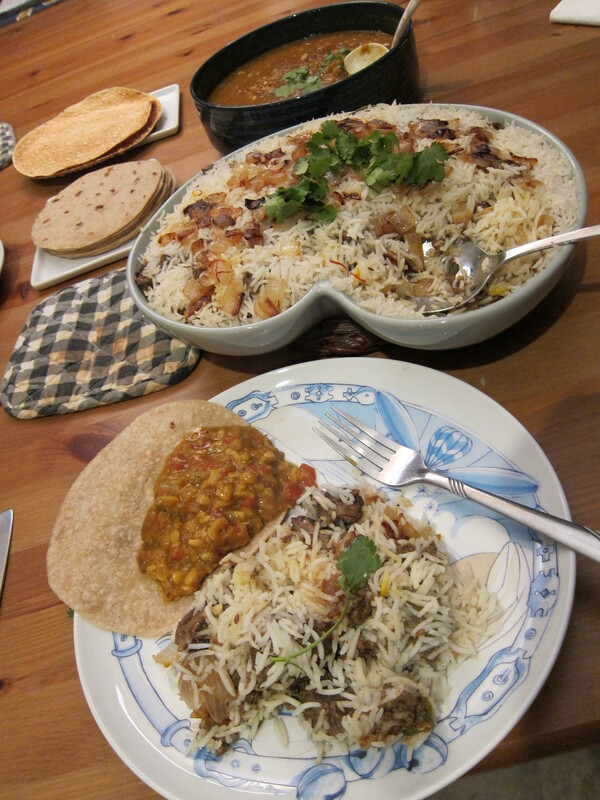 The dish originated from Persia (modern Iran) and has variations through out India, Arabia, and southeast Asia. 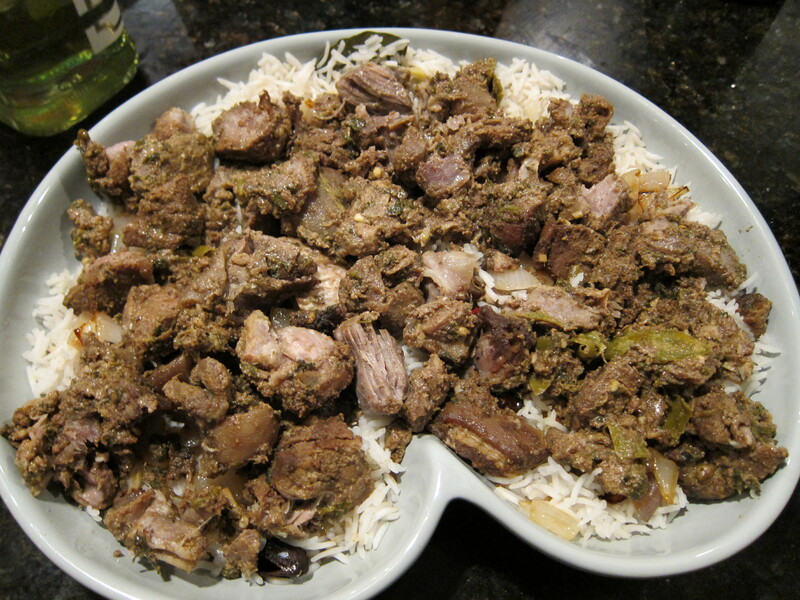 You can use chicken, lamb, beef, and even eggs as your protein in this dish, but I just happened to have some goat meat in my freezer that I decided to use. 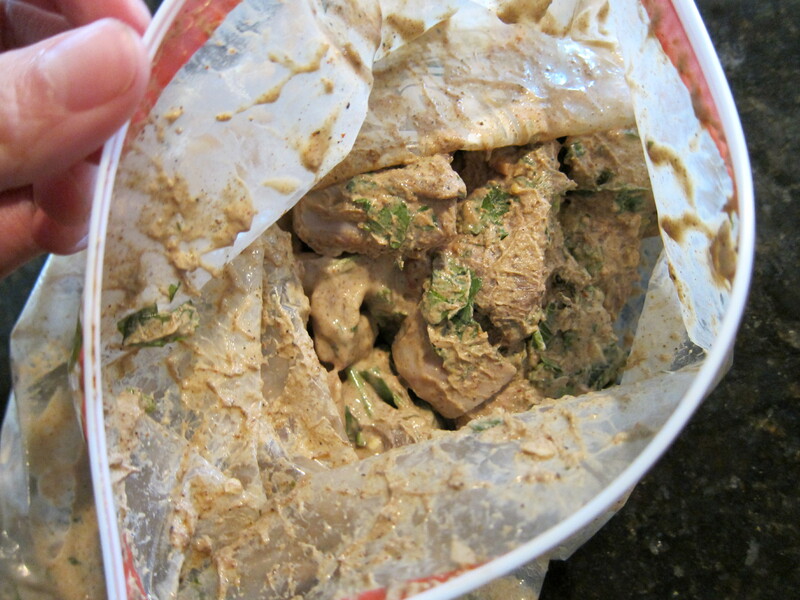 First the meat is marinated overnight in a mixture of yogurt, fresh mint and cilantro, garlic and ginger paste, and garam masala spice mix. The yogurt and spices will tenderize the meat so you want to start this dish the night before. 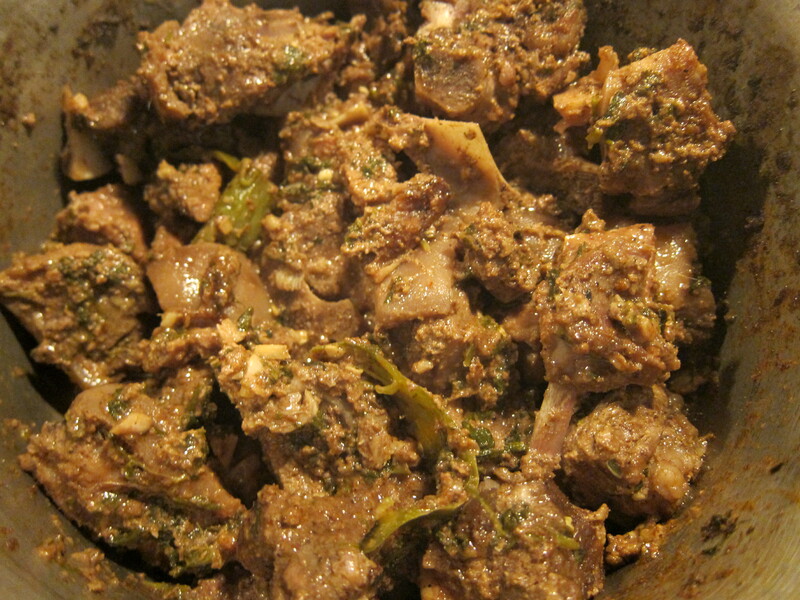 The goat is slowly braised in a pot for about 1 to 2 hours, depending on the cut. The meat should be very tender and can be pierced easily with a fork when it’s done. The meat can be deboned at this point and set aside. The rest of the dish consists of semi cooked rice in Indian spices, caramelized onions, and saffron strands soaked in milk. The bright orange/yellow color of random areas of rice in the completed dish comes from the saffron strands. 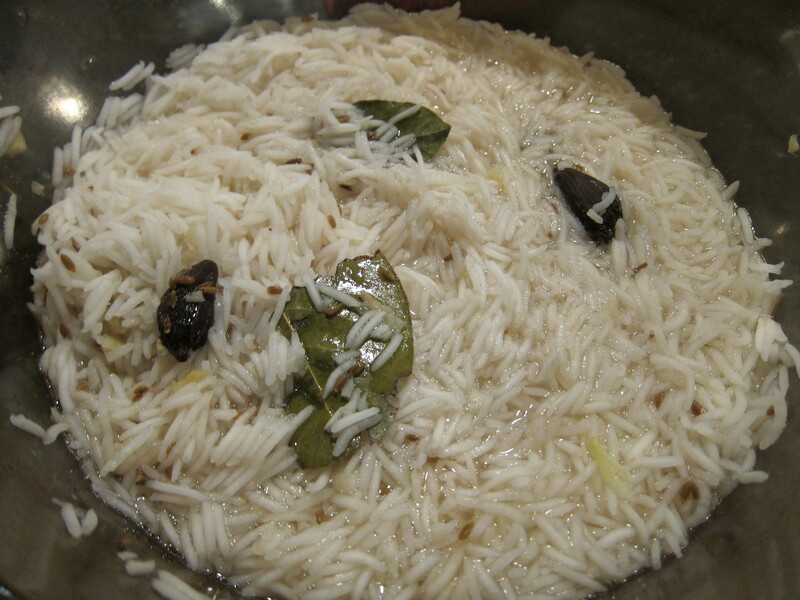 The Basmati rice is first soaked in water for 30 minutes, then cooked for 7 or 8 minutes in simmering water until it’s almost done. I only used half of the rice that the recipe called for, and I think if you followed the recipe there would be too much rice. 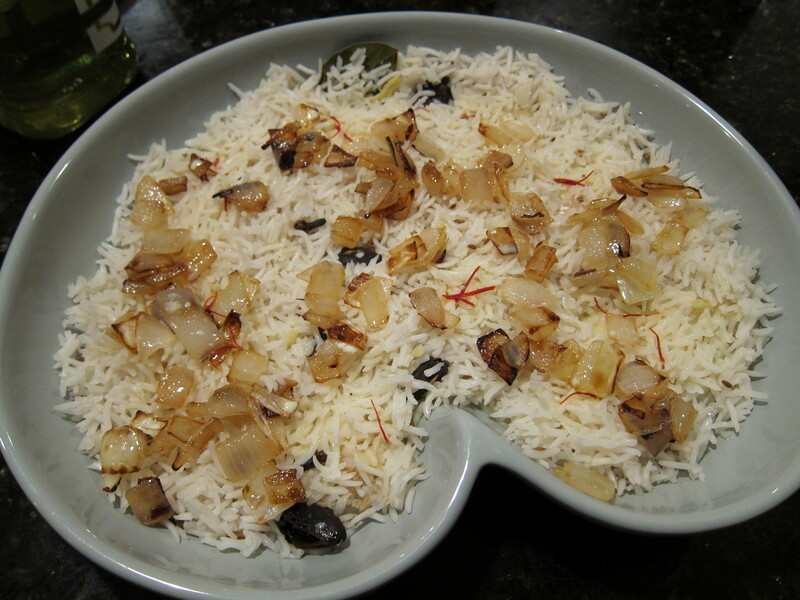 The rice is cooked with cloves, bay leaf, cardamom, and cumin, and it’s a good idea to slight toast the spices before cooking with the rice. This rice will cook faster than regular rice so you want to test it at 7 minutes to make sure it’s slightly undercooked. The rice is then drained and set aside. 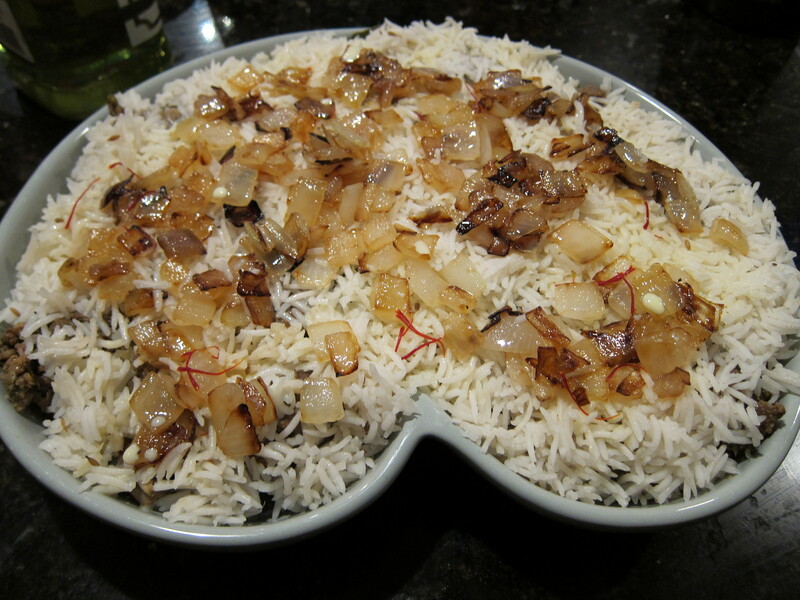 To assemble the Biryani, a layer of rice is spread on the bottom of a baking dish and caramelized onions and some saffron strands and milk are dotted on the rice. Then all of the cooked goat meat is spread on top of the layer of rice. 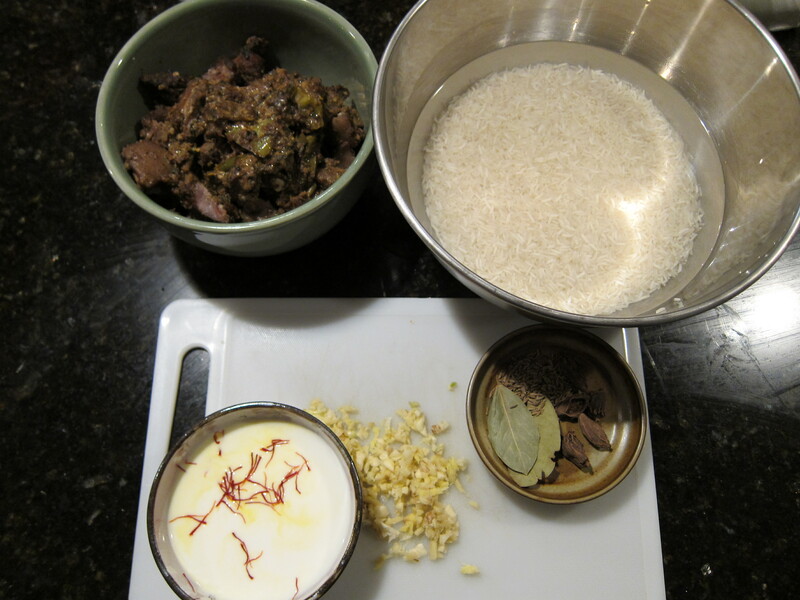 Finally a second layer of rice is spread on top of the goat, along with the remaining onions and saffron milk. The entire dish is then wrapped in foil and popped into a hot oven for 30 minutes. You can sprinkle some chopped cilantro on top if you’d like. I also decided to make Tidali Dal to go with the Biryani. Tidali just refers to the 3 different type of Dal beans, or split lentil beans. 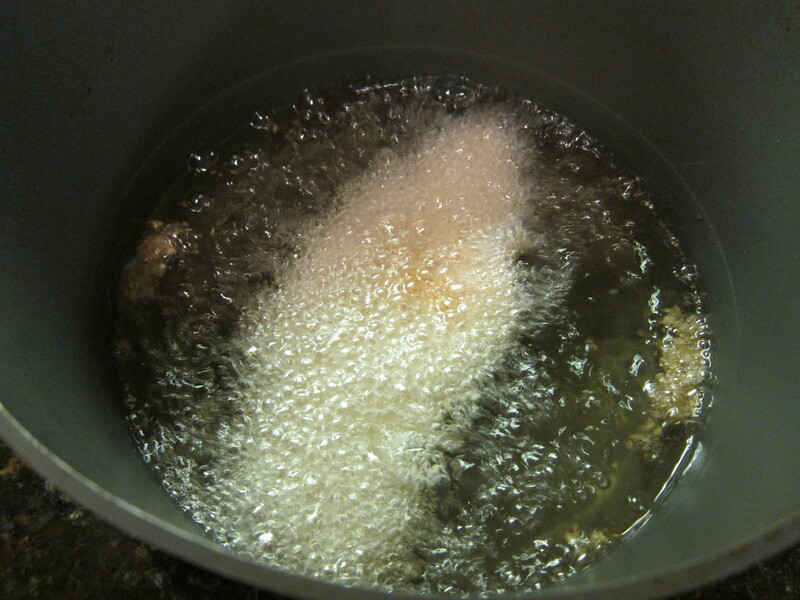 The beans are first cooked in some water until tender. 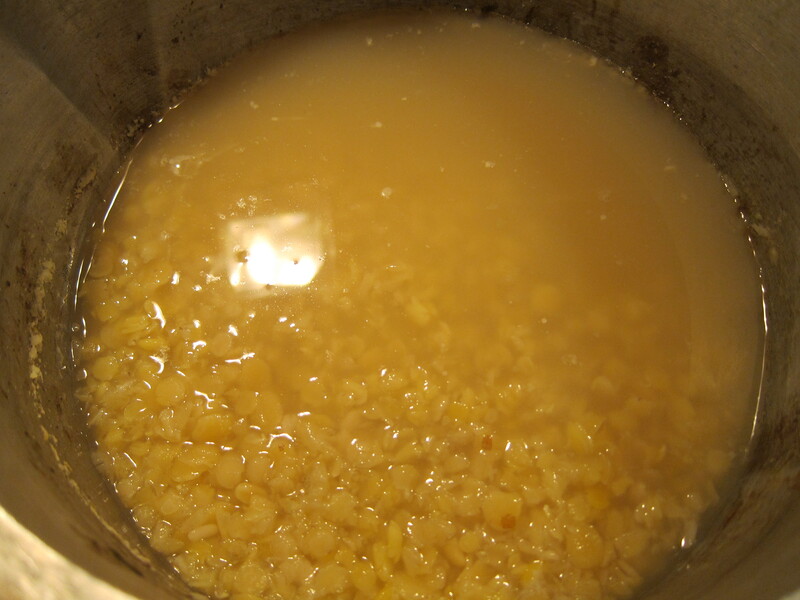 Depending on what type of Dal you use, some may need to be soaked over night before hand, and would take longer to cook. The Dal I used only took about 30 minutes to cook until tender, so you want to check the cooking instructions that comes with your Dal. 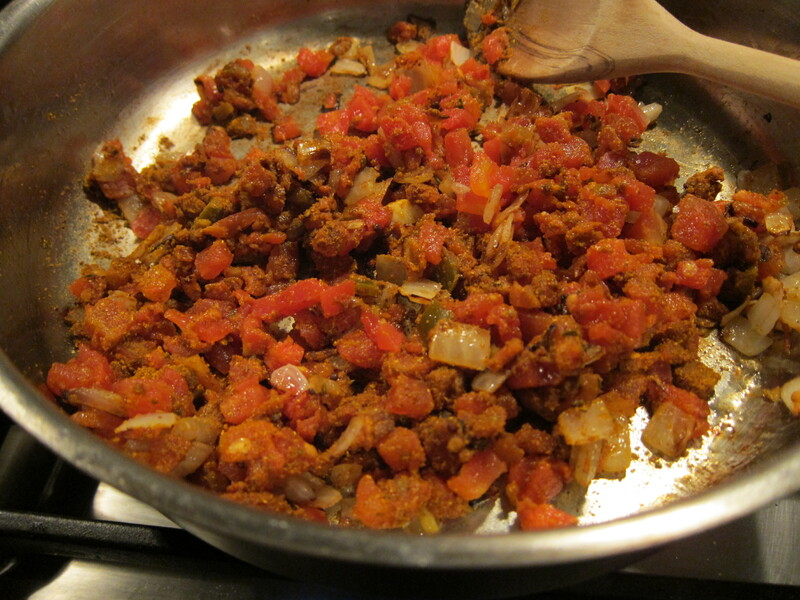 Then some onions are cooked until they are starting to brown, and some chopped tomatoes and spice mix are added to the onions. 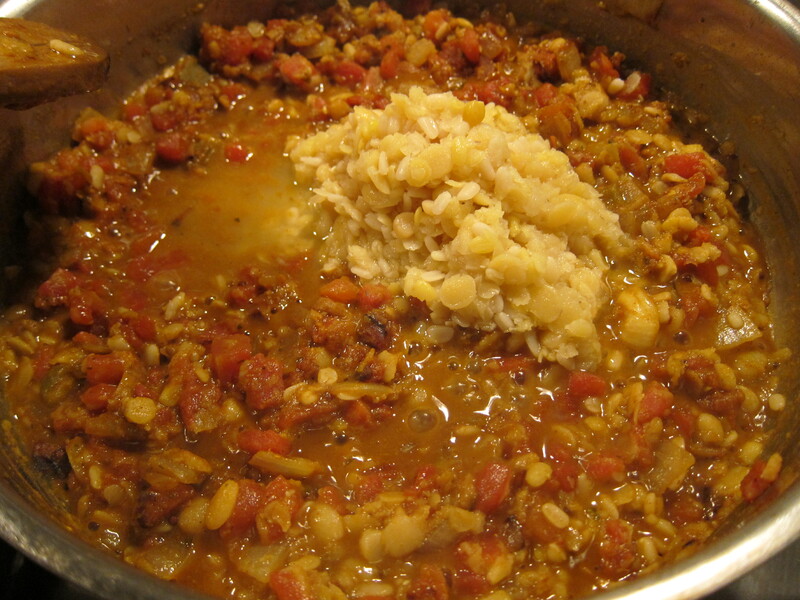 Once the onion and tomato mixture starts to dry out, about half of the cooked lentils is stirred into the pan. Eventually, all of the lentils will be added to the pan and simmered for about 5 minutes. You can adjust the seasoning at this point. 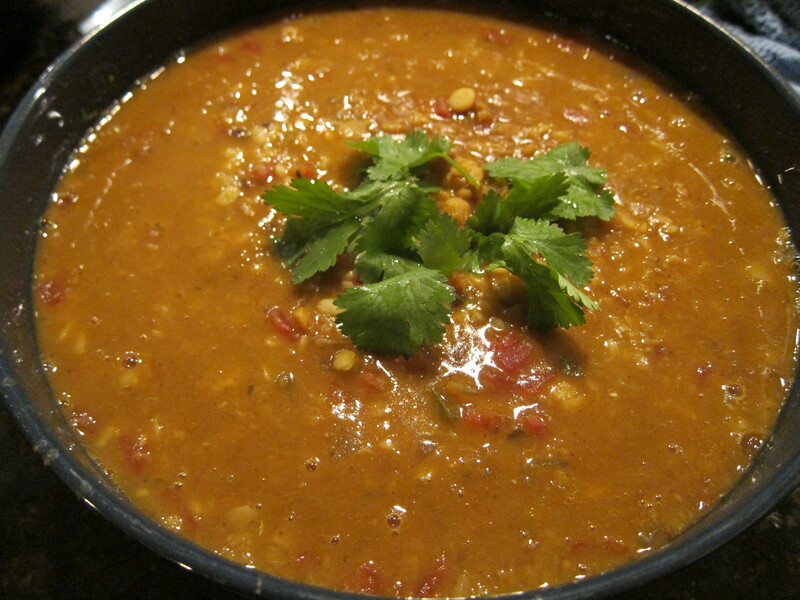 The Dal recipe is completely vegan. To finish up the menu, I bought some local Indian grocery made Chipati bread, along with some microwavable Pappadums. 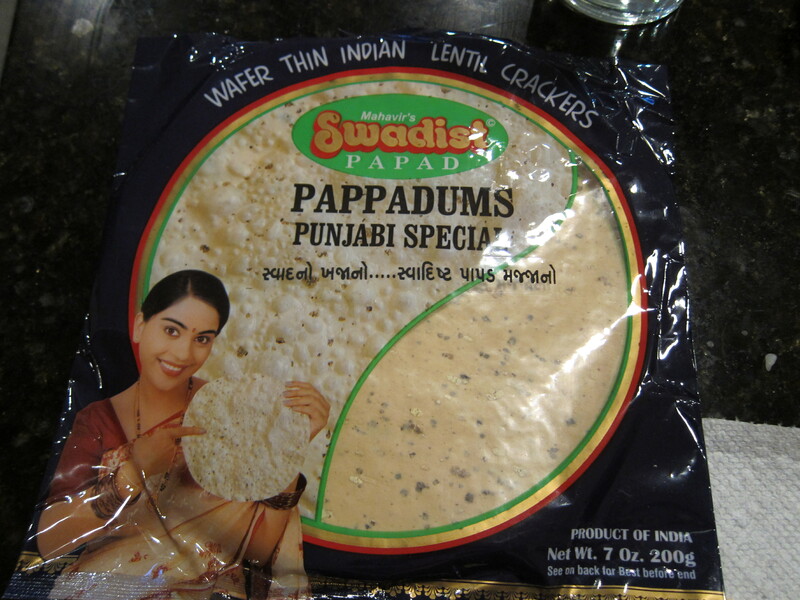 Pappadums are these thin, crispy wafers flavored with spices that is ubiquitous in Indian cuisine. I always thought it would be really hard to make and fry up these paper thin wafers, but apparently you can buy premade ones and cook them in the microwave. There were many brands at the Indian grocery, so I just randomly picked one. The instructions say that you should put it in the microwave for 50-60 seconds. I find that for my microwave, it only takes about 30 seconds, so it would be a good idea to try different cooking times. 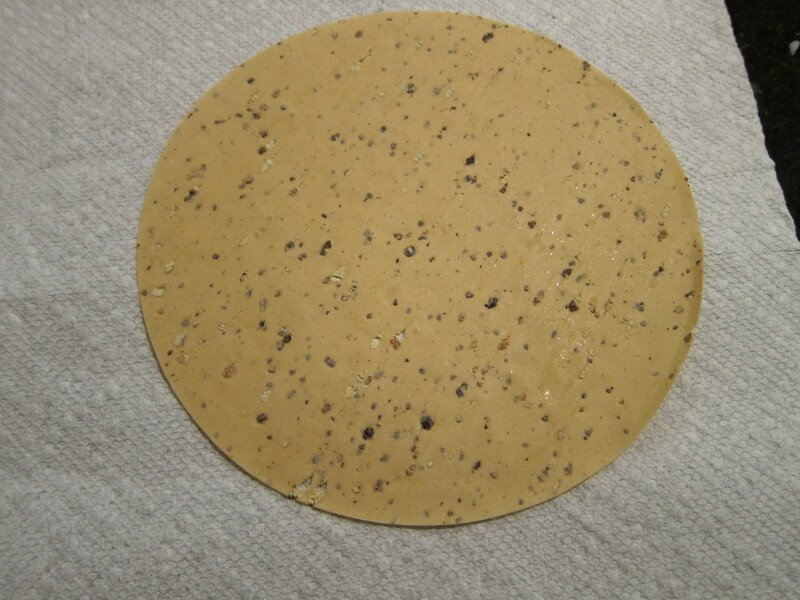 The pappadum before looks like a piece of hard flour with spices laminate into it, and afterwards it looks exactly like the pappadums served at Indian restaurants. 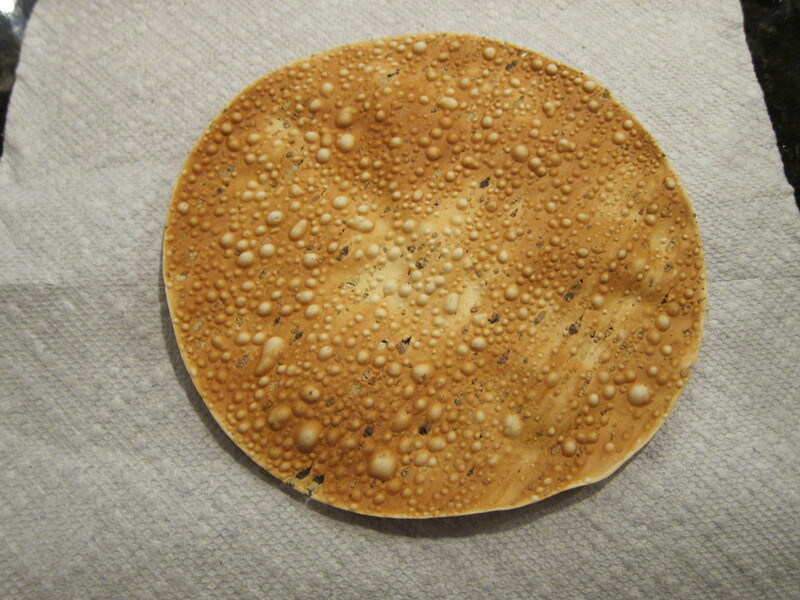 you can see that after 50 seconds, my pappadum is a bit brown. It still tasted good but I will only do 30 seconds next time. 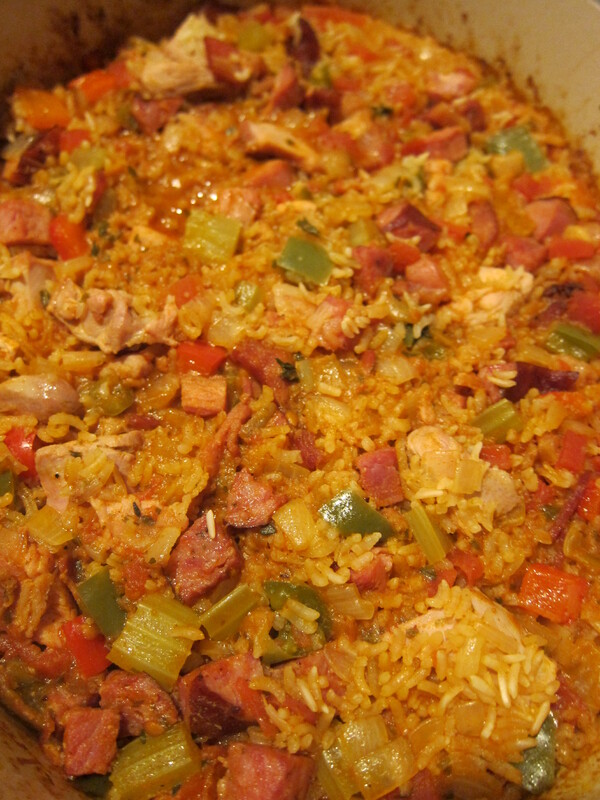 For a long time, I had thought that Jambalaya was a gimmicky dish. I’ve had many many bad Jambalayas in restaurants past… ones with under cooked or soggy rice, ones that tasted like a big pot of tomato sauce, and ones packed with fatty greasy sausage. 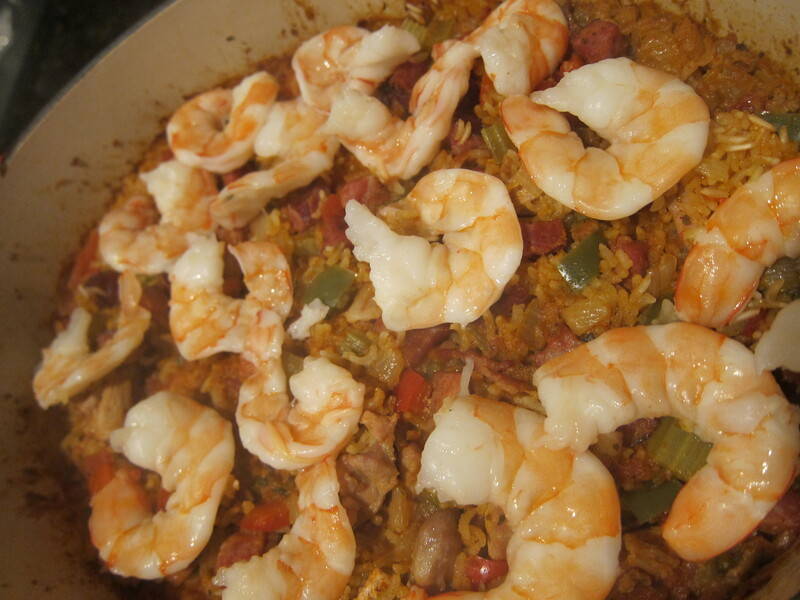 But for something that sounds so similar to Paella, which is one of my favourite dishes, I believe that the dish itself had a lot of promise, just not at the Cajun themed restaurants I had been to. A while back I tried the recipe from Bon Appetite magazine, pretty much on a whim due to the pretty photograph in the pages. It actually turned out really really well. 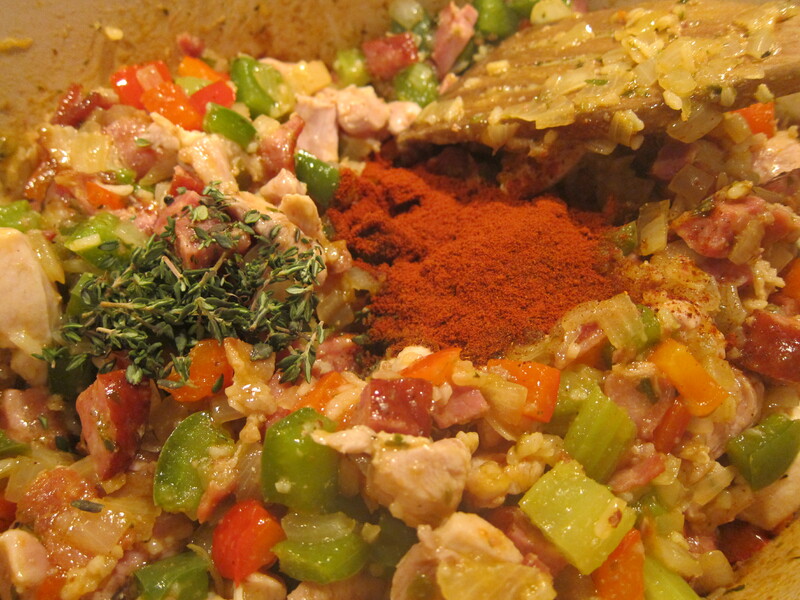 The recipe calls for Chicken, Tasso (smoked ham), Andouille Sausage, and smoked sausage. I substituted the Smoked Sausage for chicken sausages, and the Andouille Sausage was already smoked. I also added shrimp at the end. The recipe is quite straight forward, you fried up some bacon in a pot, then add the smoked meats and cook until browned. 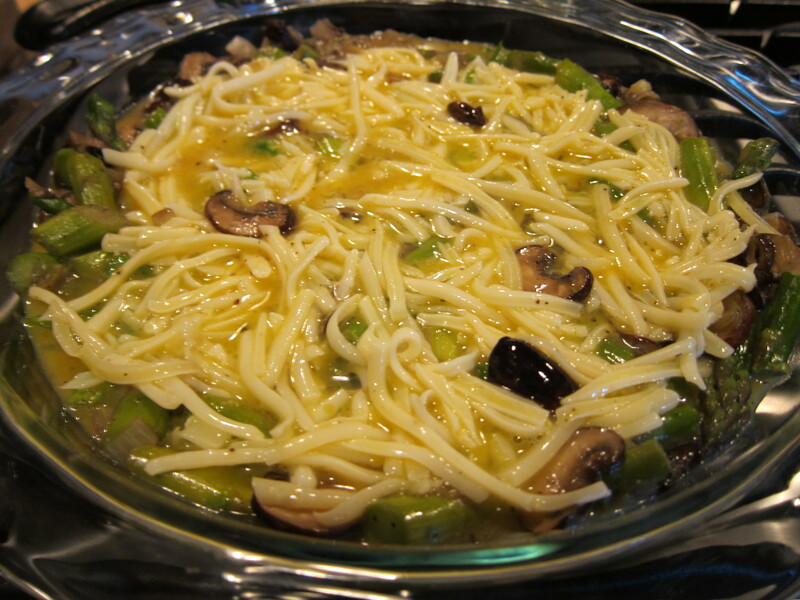 Add the vegetables which includes bell peppers, onions, celery and cook until softened. 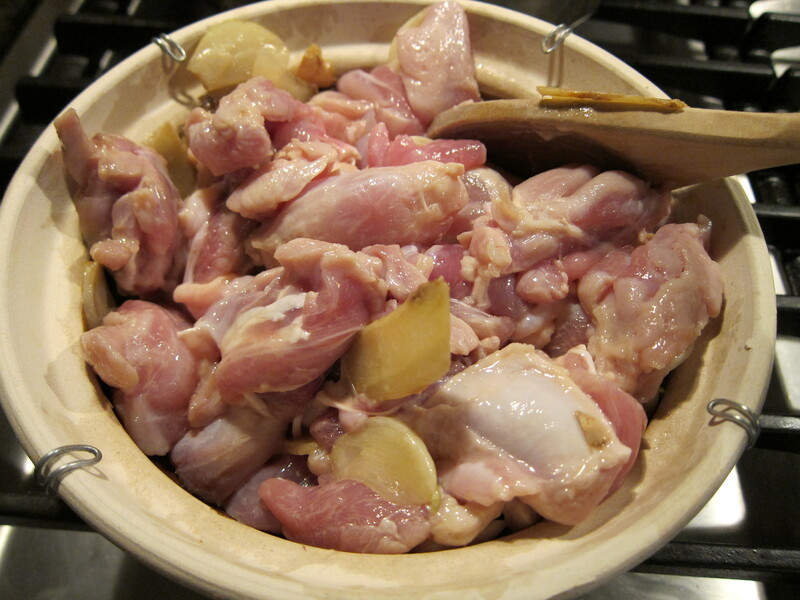 At this point, the raw chicken is added to the pot and cooked, stirring often, until it becomes white. and thyme and chili powder are stirred in. Rice is then added to the pot, along with a few cups of chicken or vegetable broth, and the whole thing stuck in the oven and cooked for about 50 minutes. I decided to add shrimp to the recipe, and I hate overcooked seafood. Instead of stirring the shrimp into the pot and keeping it in the oven, I decided to just lay the shrimp on the top of the Jambalaya, close the pot, and let the natural heat from the pot steam the shrimp. It worked like a charm. Since Jambalaya is considered to be southern cuisine, I decided to make corn bread baked in the skillet. 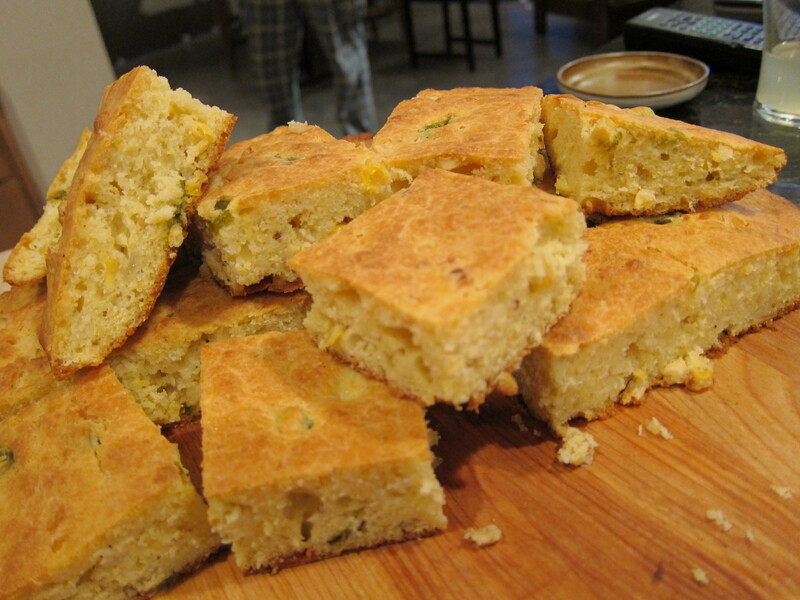 The cool thing about this corn bread recipe is that it calls for a Corn relish that is made from fresh corn kernels, cooked in vinegar and sugar with some onions and roasted peppers, so that when you bite into the corn bread, you get bits and pieces of fresh corn. Finishing up the menu, I made some Quinoa with Hearts of Palm, which is vegan, and a roasted Asparagus salad with shaved Parmesan cheese. 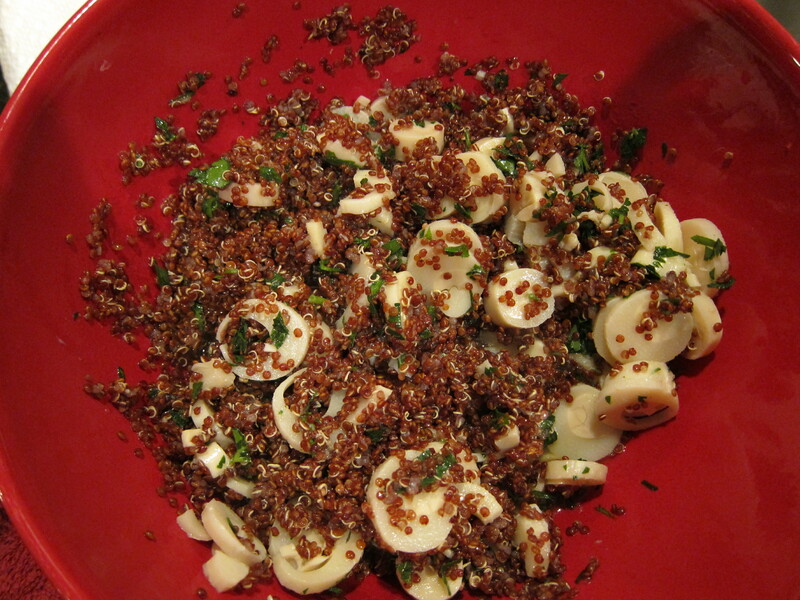 The Quinoa dish takes about 20 minutes to make and will sit pretty well while you work on other dishes. I added roasted pecans to the dish to give it an extra layer of texture. 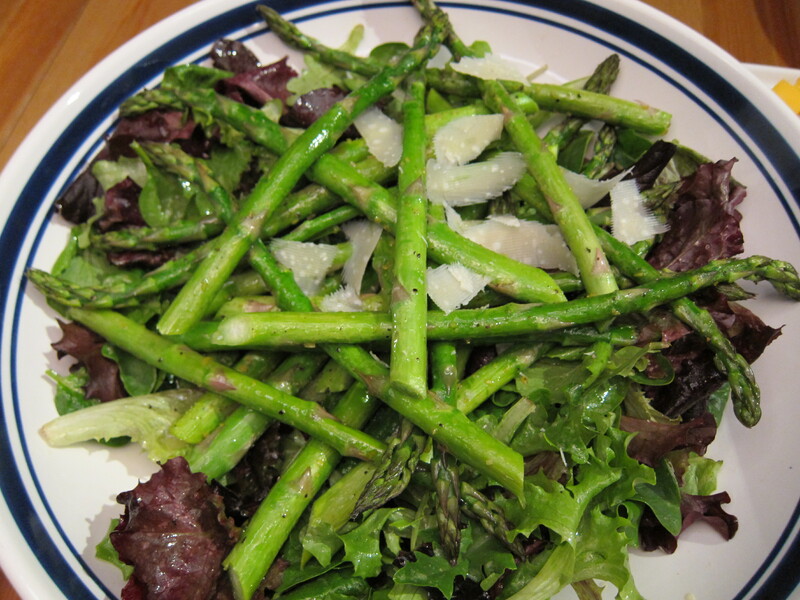 The Asparagus are roasted in olive oil and lemon zest for about 6 or 7 minutes, and then tossed with a lemon and olive oil dressing. I’m not a breakfast person, usually because I’m always up before I’m really hungry, and before I know it, it’s close enough to Lunch time. Weekends, however, is a different story. If I don’t have to go up to go anywhere in the morning, I always feel like making something. I wanted to make traditional pancakes this Saturday morning, but I didn’t have ricotta cheese and the buttermilk had expired. I looked in the fridge and all I had was milk, and some leftover strawberry and blackberries. 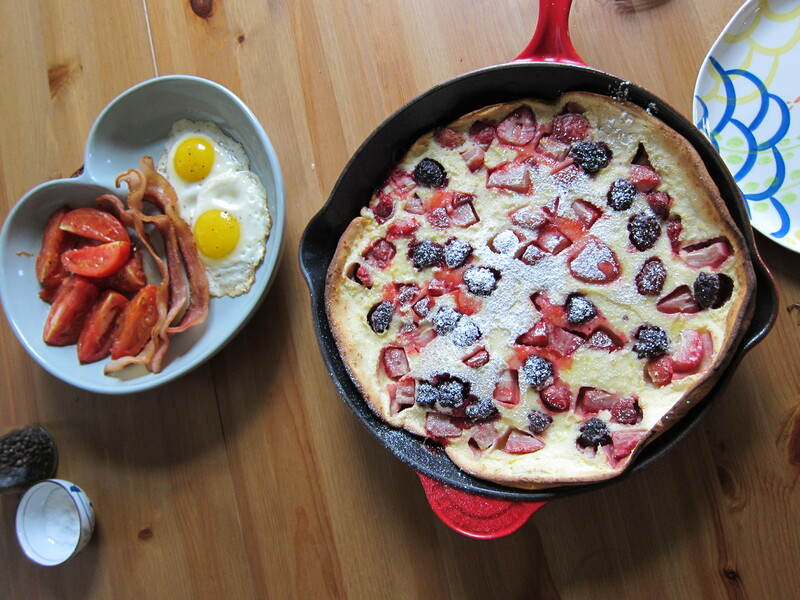 Luckily, I was able to find a recipe for a mixed-berry Dutch baby pancake from Foodandwine.com that required just those items, and flour and sugar, which are kitchen staples for me. 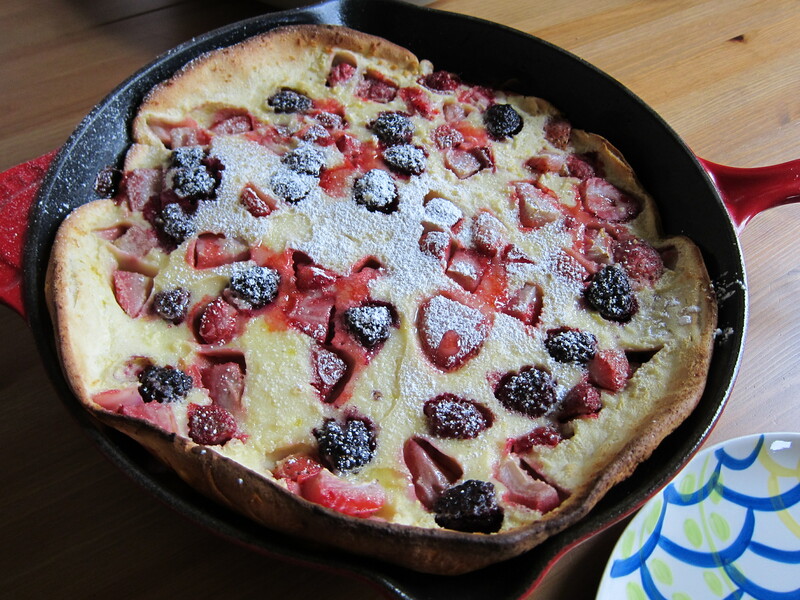 A Dutch baby is a German pancake that is baked instead of cooked on the stove top. It worked out really well because the pancake takes about 20 minutes to cook in the oven, and I was able to work on the rest of the breakfast during those 20 minutes. 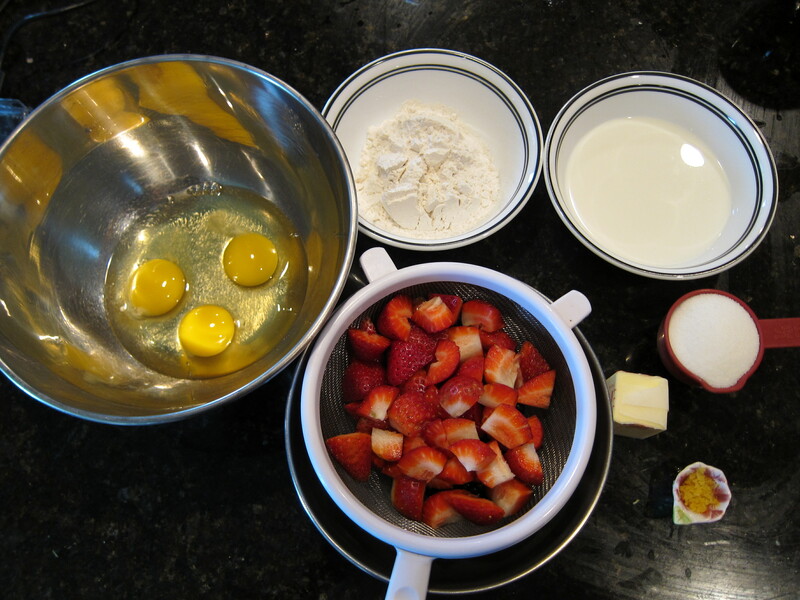 The cooking process is fairly simple: eggs, sugar, flour and milk are whisked together until smooth, and berries are added to the mixture. The recipe called for raspberries, but I just used what I had on hand. I think any berry or stone fruit combination should work. An oven proof pan is heated over medium low heat on the stove top, just hot enough to melt a couple of tablespoons of butter. 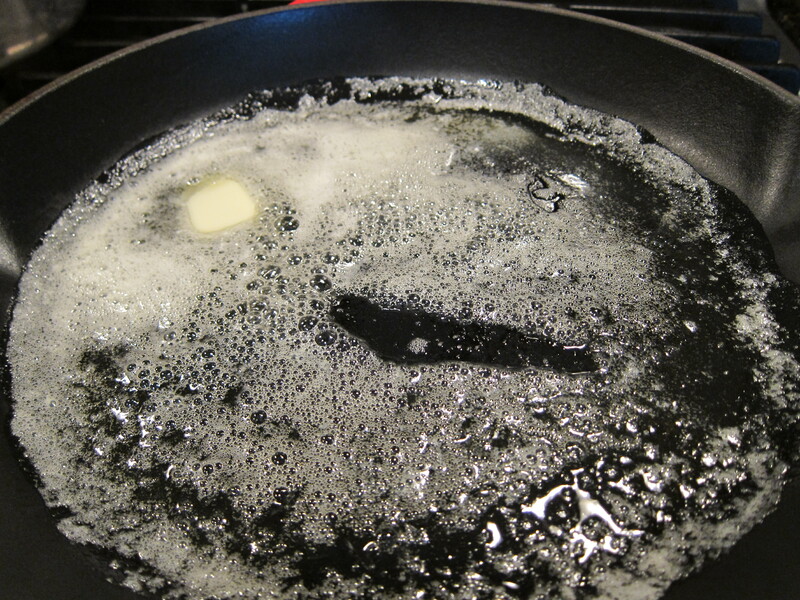 Once the butter melts completely, the heat is turned off, and the batter is poured into the pan. 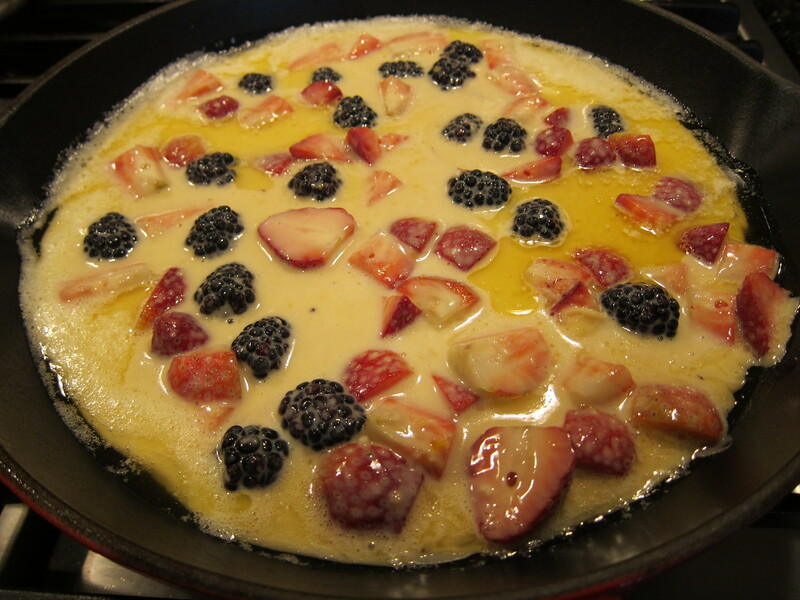 You want to evenly spread out the fruits, and keep the fruits away from the edges, so that all sides of the pancake will puff up. I had some fruits near the edge of my pancake and my pancake didn’t puff up completely on all sides. The pan is placed into a 425F oven for 20 to 22 minutes, until the pancake is all puffy and browned on the edges, and slightly puffed in the center. You want the brown edges because they are actually crispy, and it’s a good contrast of texture against the rest of the soft pancake. Some powdered sugar can be dusted on top of the pancake if you’d like, and it’s ready to serve! 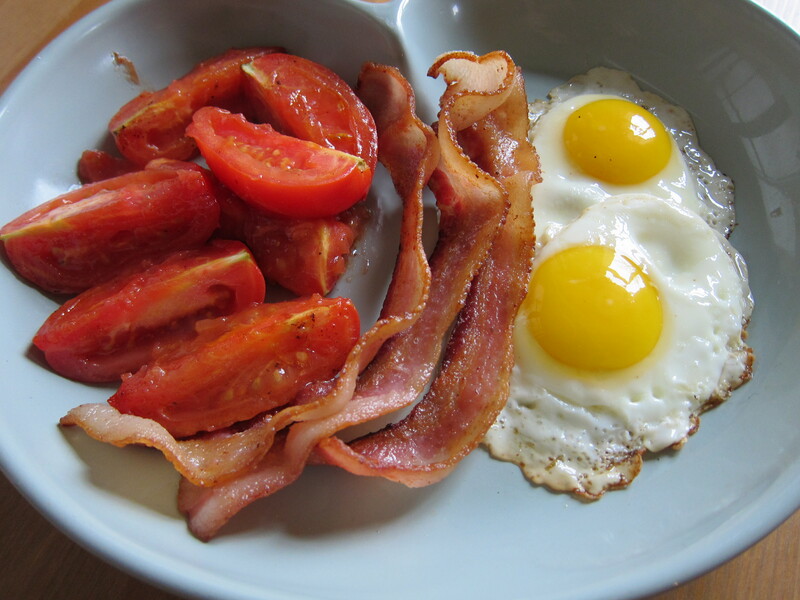 I finished up the breakfast by frying up some bacon, and cooked some eggs and fresh tomatoes in the left over hot bacon fat. 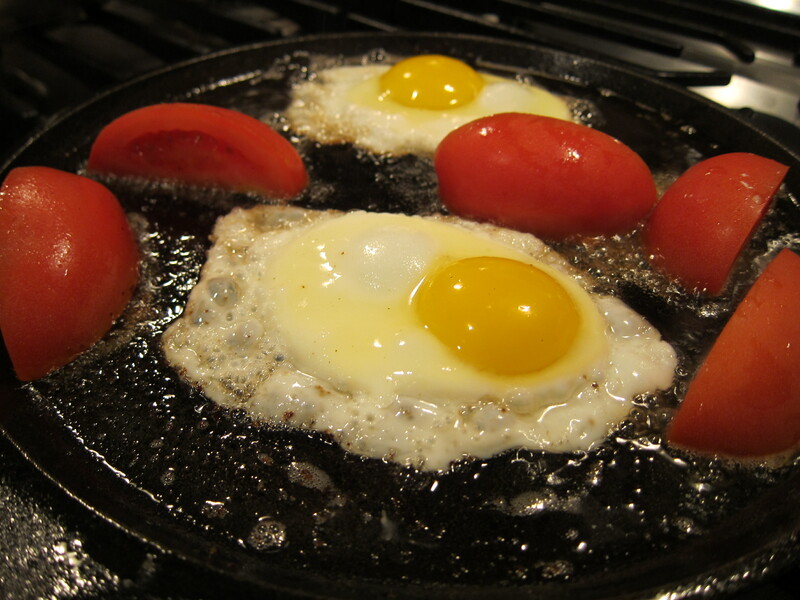 My boyfriend likes the eggs over easy, and the fried tomato idea I got from our travels through Ireland, where a full Irish breakfast would always be served with fried tomatoes. Rasamalaysia.com is a great resource for Asian food. 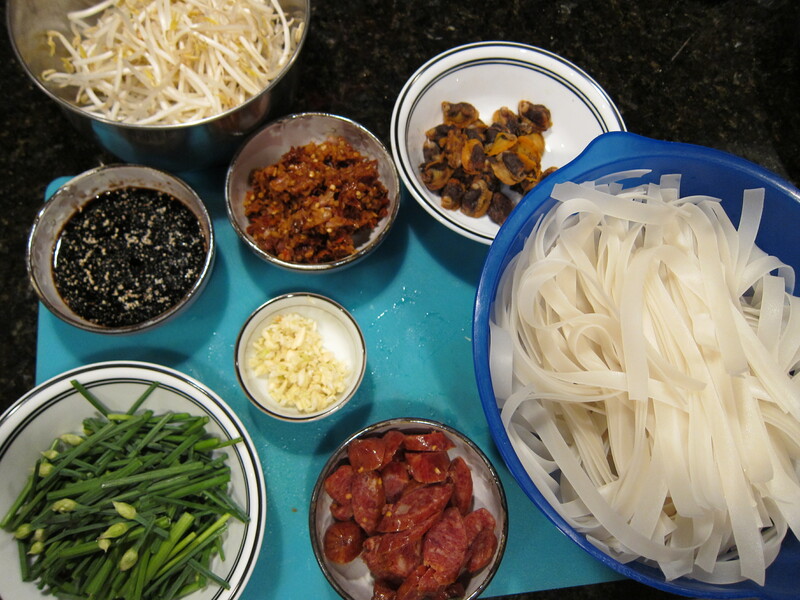 The blogger not only has really great authentic Malaysian and Chinese recipes, she also links recipes from other Korean and Japanese food blogs that’s tested by her. It’s a really great website to find Asian recipes that’s certified good. 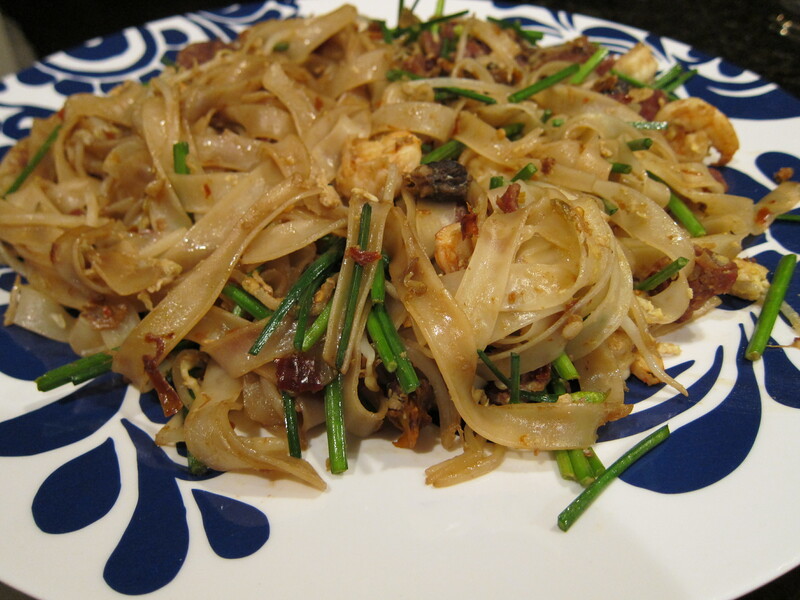 A noodle recipe that I really like to make is Char Kuey Teow, which is Malaysian sauteed street noodles. Ingredients are cooked over high heat in a Wok along with a fiery chili paste made with both fresh and dried chilis. Timing and proper heat is crucial to the success of the recipe so it’s important to have all the ingredients prep-ed and ready assembly line style for the fast paced cooking. 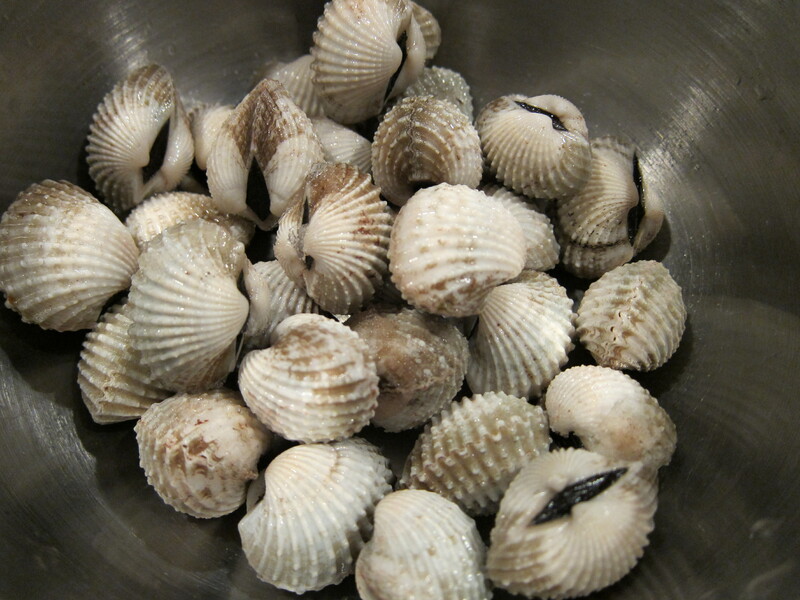 One ingredient that the recipe calls for is Bloody Cockles, which is a type of clams. You can find these frozen in-the-shell from asian supermarkets. 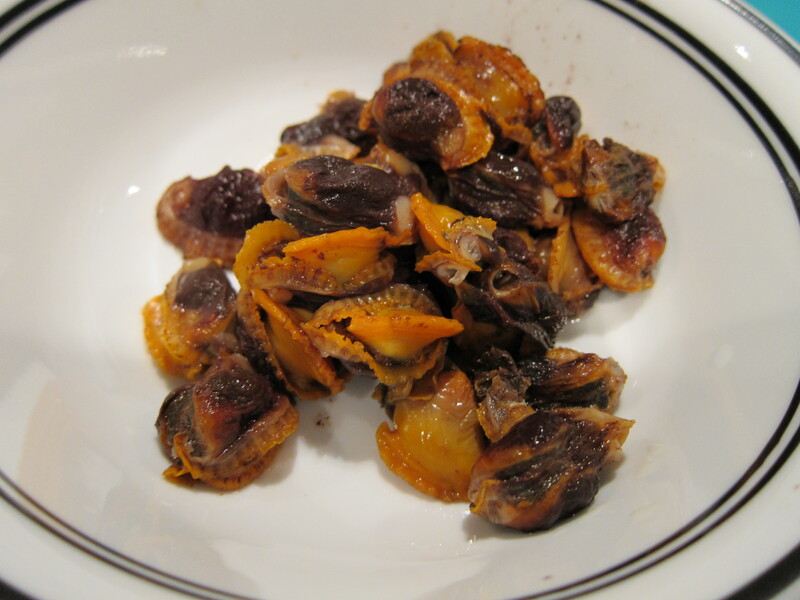 Once they are thawed, you can open the shells and extract the meat. The Wok needs to be very hot, and you have to be ready to dedicate the next few minutes only on cooking, since it’s easy to burn the ingredients by just leaving the wok for a few seconds. The garlic is cooked first, then the shrimp and chinese sausage. The vegetables and noodles are added along with the egg. When you add the chili paste, it’s a good idea to add a little in the beginning and add more later if you really like spicy. It’s easy to go overboard on the spiciness so be careful. The Noodles can be slightly blackened but still al-dente. 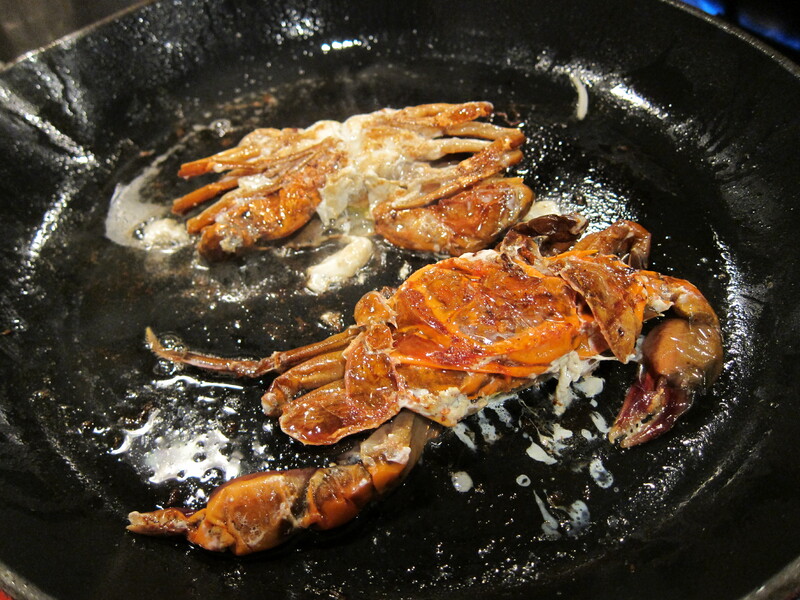 The other recipe I decided to try along with the noodles is a Soft Shell crab bun recipe from David Chang. I found this recipe in nymag.com and I have to say that it was just so-so. I didn’t have time to make the buns by hand so I bought some frozen ones from the local asian supermarket. 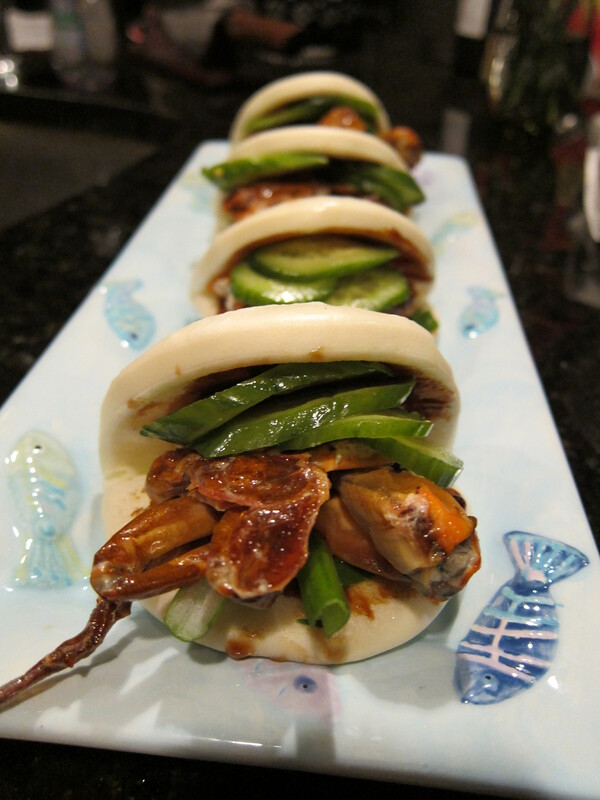 The soft shell crabs are seared in some bacon fat, halved and filled into the buns with quick pickled cucumbers and hoisin sauce. Like I said, the crab bun is just so-so, which could be because the crab I bought were frozen, or that my pan wasn’t hot enough.